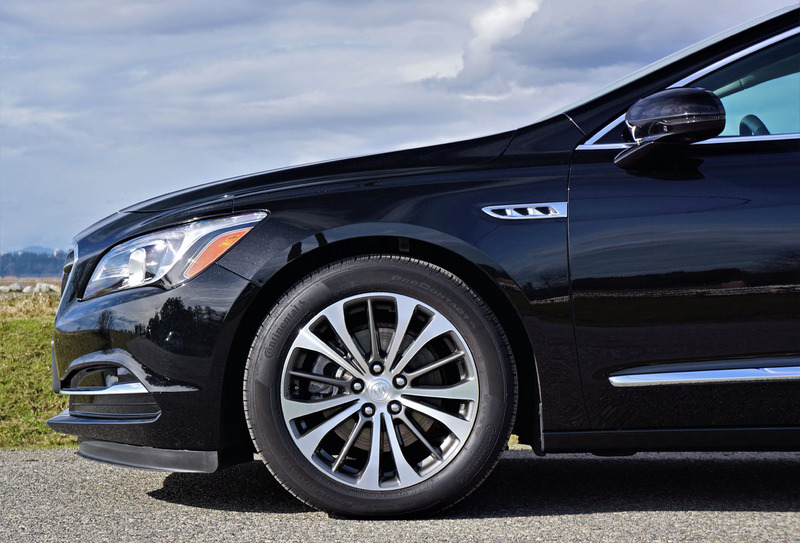 vote, as it’s been touted most dependable for decades. 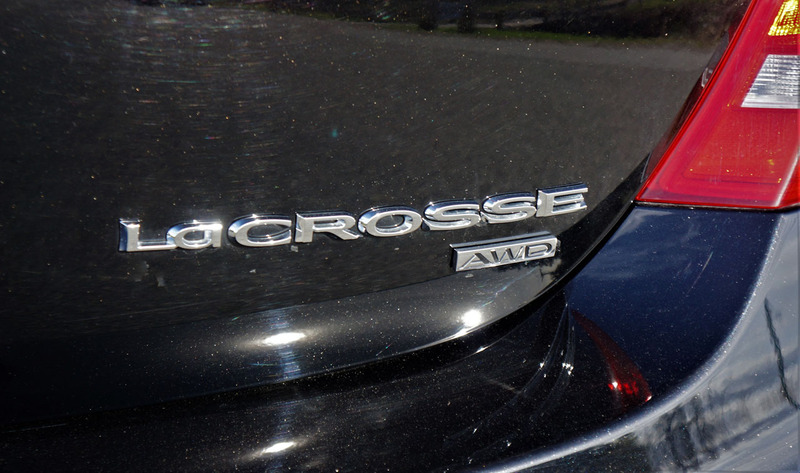 Once again it sits on top of J.D. 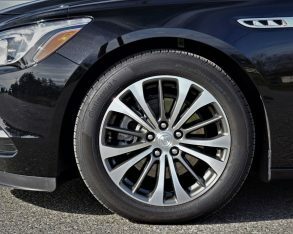 Power and Associate’s 2017 U.S. 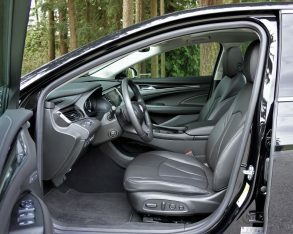 Vehicle Dependability Study, as well as first place with Consumer Reports’ most reliable car brands in America report. 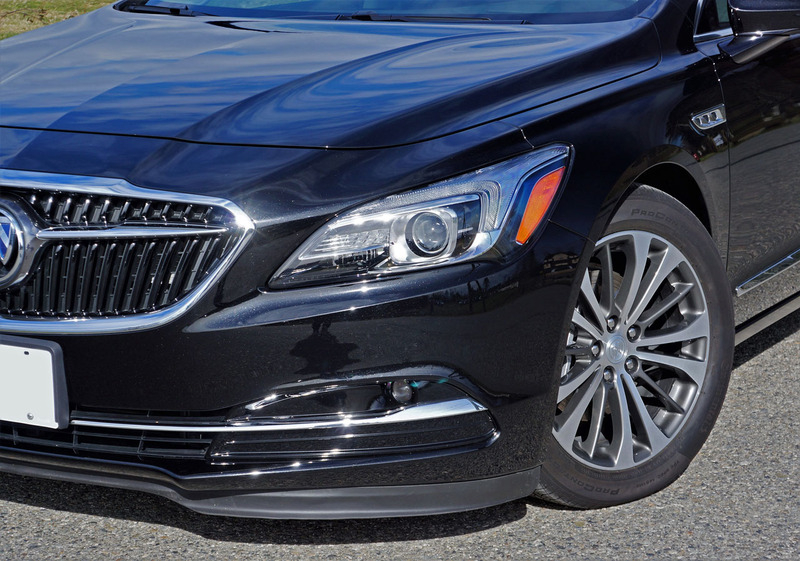 manages a solid fourth in J.D. 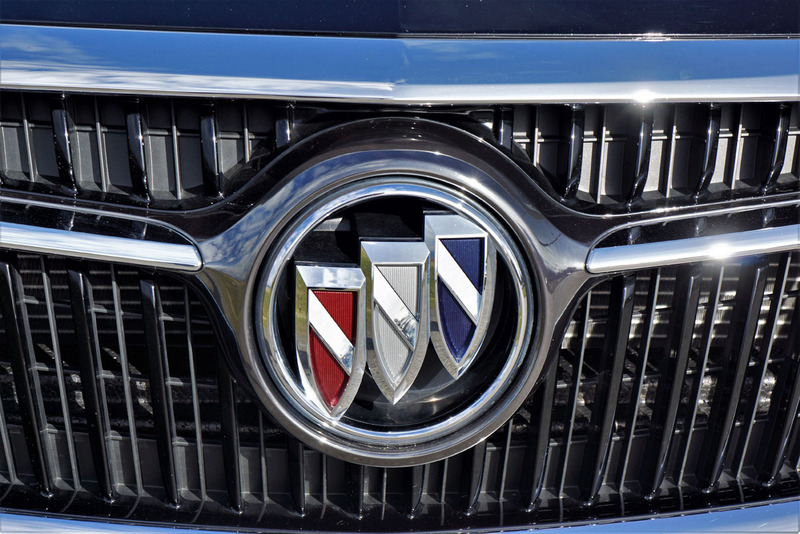 Power’s ranking, which is still mighty impressive considering 31 brands are in contention. 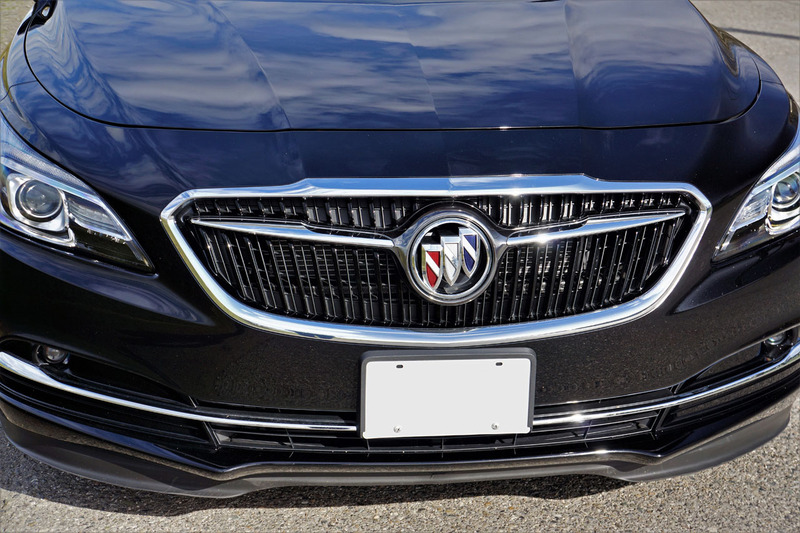 Depending on how we choose to classify Buick as a brand, its standing moves up within each of these third-party analytical firms’ surveys. 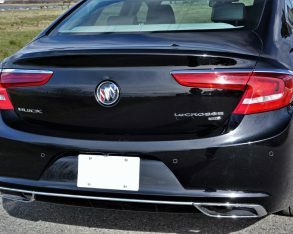 Buick kind of rides the fence between the mainstream volume and premium sectors because of models like the little Encore subcompact crossover SUV that starts at just $23,495, and the recently departed Verano compact sedan that was available for only $24,190 earlier this year, but the majority of its models are justifiably premium by price as well as build quality and features, even if the brand’s cachet may have lost a little shine since the ’60s. 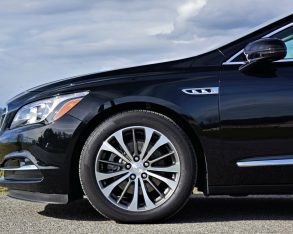 true heyday was probably the mid-to-late ’30s when the Series 60 Century reportedly swept up North American hearts, but my reason for entering Buick into favourite brands status is the stunningly beautiful ’63 Riviera. 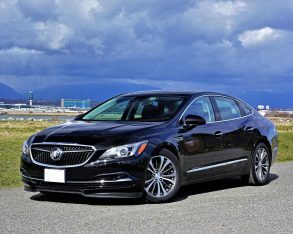 Interesting (to me at least), my mom was born in 1936, the same year the Series 60 Century came into existence, while I was brought into the world in 1963. 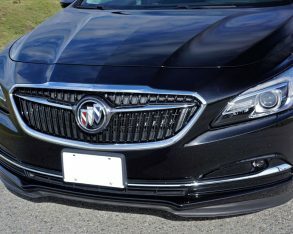 Sadly, my mom’s first Buick wasn’t either of these two classics, but rather a mid-’80s Somerset Regal coupe, which was a very good car for reliability and creature comforts, but not exactly one of the brand’s more collectible works of rolling art. 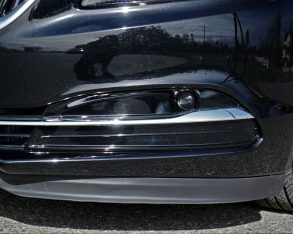 Even sadder, I’ve yet to add a ’63 Riv to my personal collection. 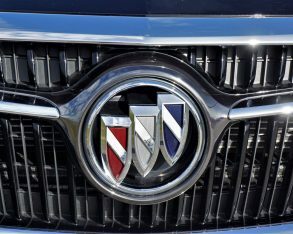 means they’re either somewhere on the endless auto show circuit or pent up in a car museum, hopefully alongside the particularly pretty 2004 Velite concept convertible and industry-changing 1938 Y Job roadster. 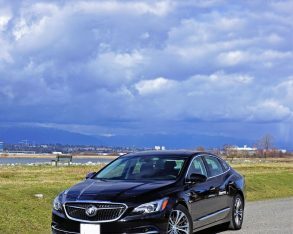 I recently had the new 2017 LaCrosse at my disposal, which I must say is a far cry more attractive than the original 2005 LaCrosse that I initially drove as part of its launch program in late 2004, albeit in Canadian-spec Allure trim. 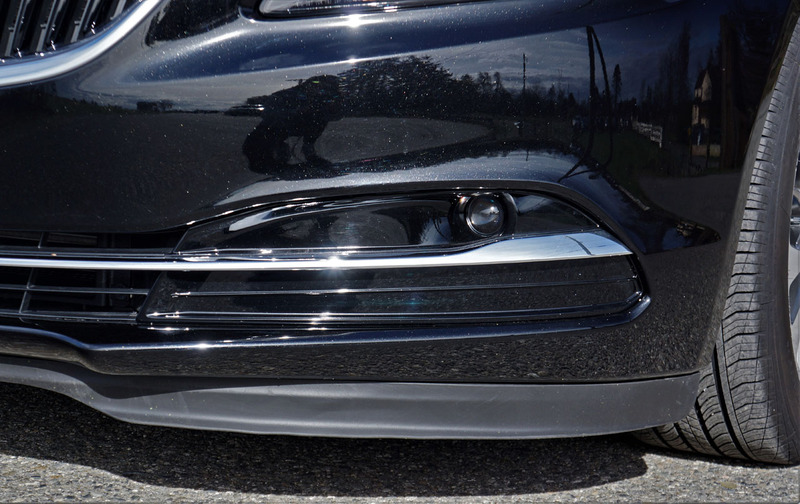 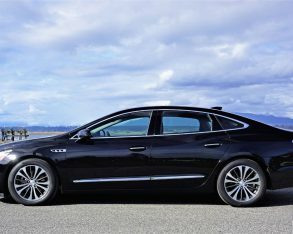 It was a pleasant looking car, but it wasn’t something that could compete head-on with global luxury brands. 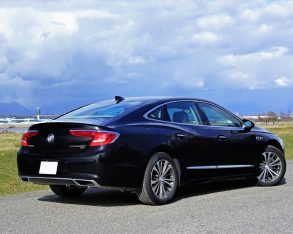 Heck, it didn’t even do all that well against Toyota and the rest of the mainstream imports, but this new 2017 LaCrosse can certainly give an Avalon a run for its money, and could even be cross-shopped by Lexus ES 350, Acura RLX, and possibly even Volvo S90 buyers. 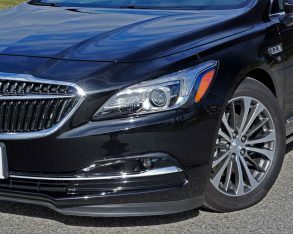 not all, of course, but I hesitate to say Lincoln anymore, at least not since the absolutely brilliant Continental is among us, but let’s not forget GM has its sharply angled Cadillac brand to deal with this arch-nemesis. 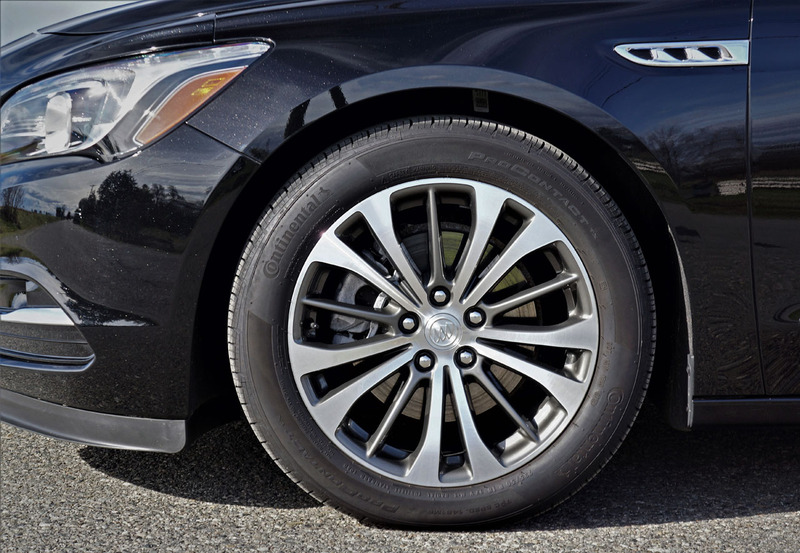 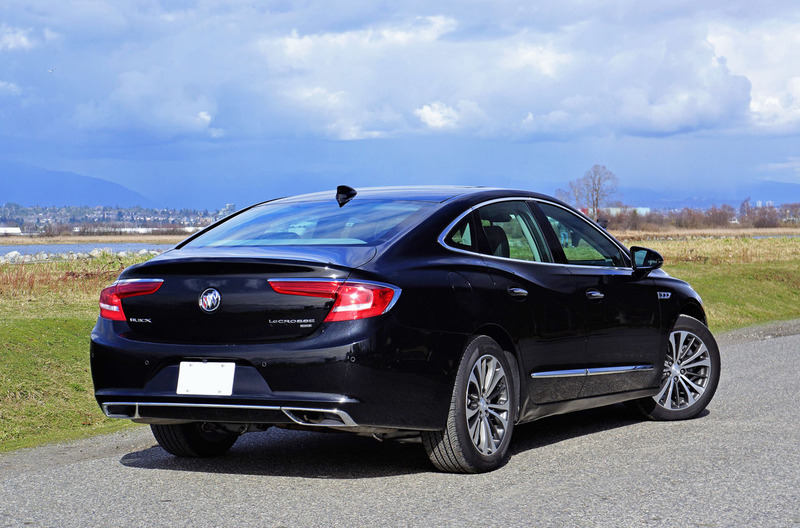 Anyone considering a Chrysler 300 should certainly take a stroll over to their local Buick dealer too, while I would choose the new LaCrosse over Nissan’s latest Maxima, as well as a few other would-be competitors. 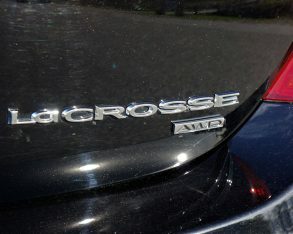 In many ways the LaCrosse is more advanced than the cars just mentioned, while it’s nearly as premium-like as the arguably higher end luxury-branded models, especially with respect to interior finishings, materials quality, electronic interfaces, comfort, quietness, mechanical components and driving dynamics, whereas its styling, inside and out, will come down to personal taste as always. 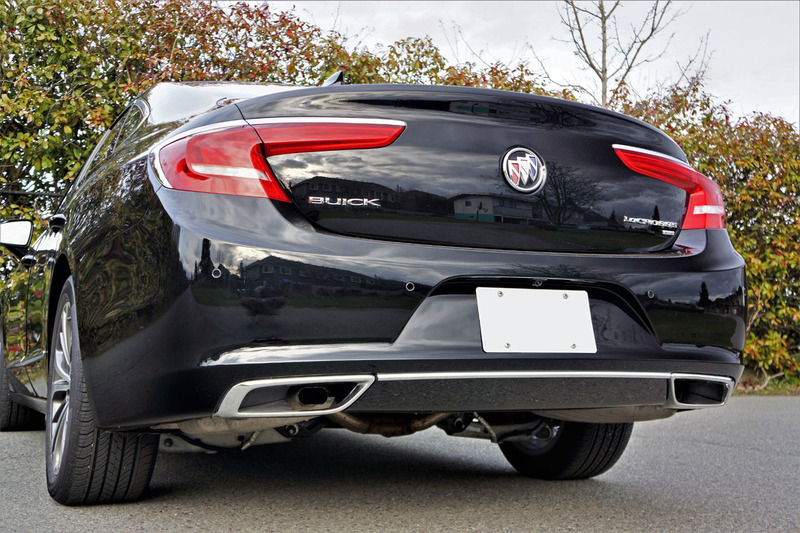 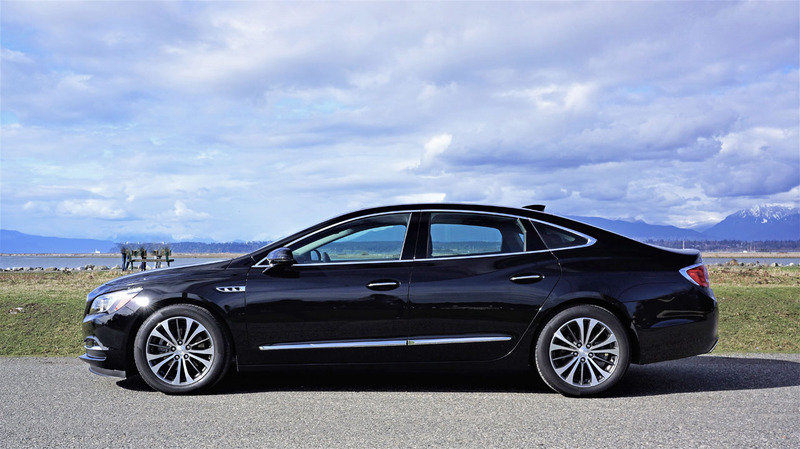 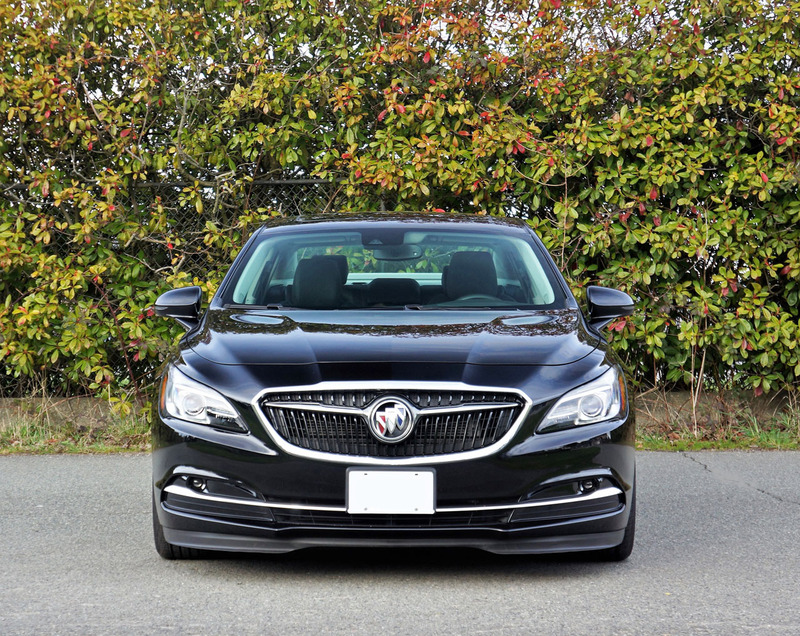 I find it quite handsome, but to Buick’s credit and this car’s critics, it’s no Avenir. 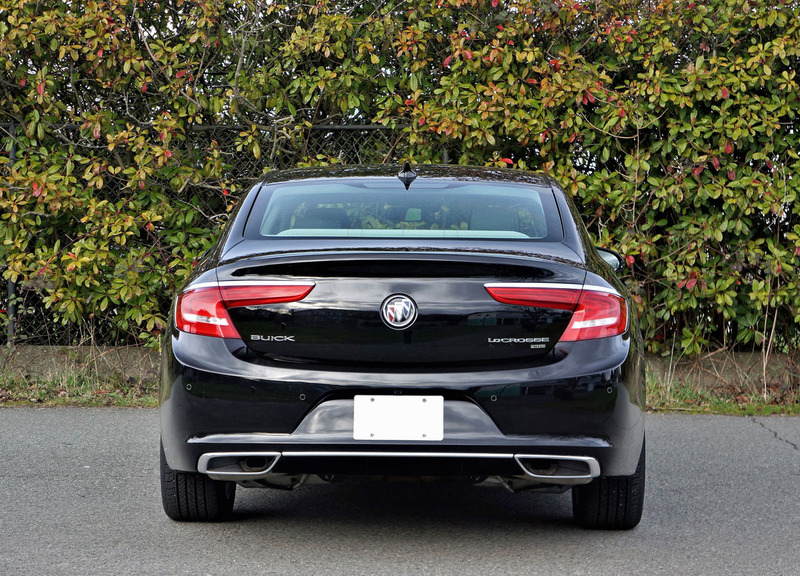 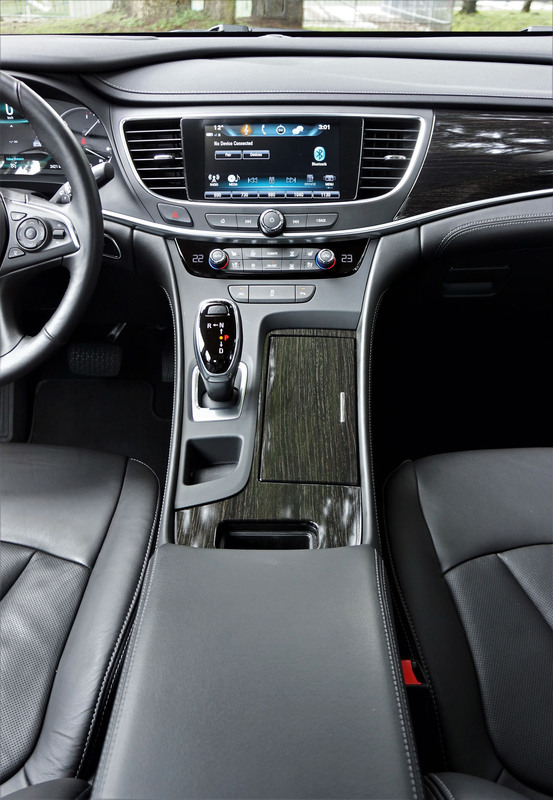 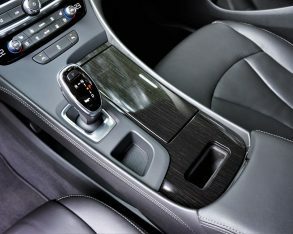 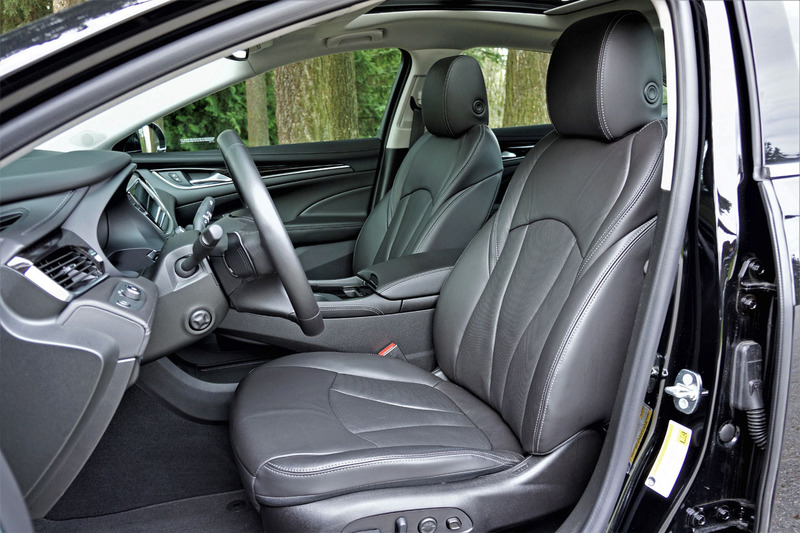 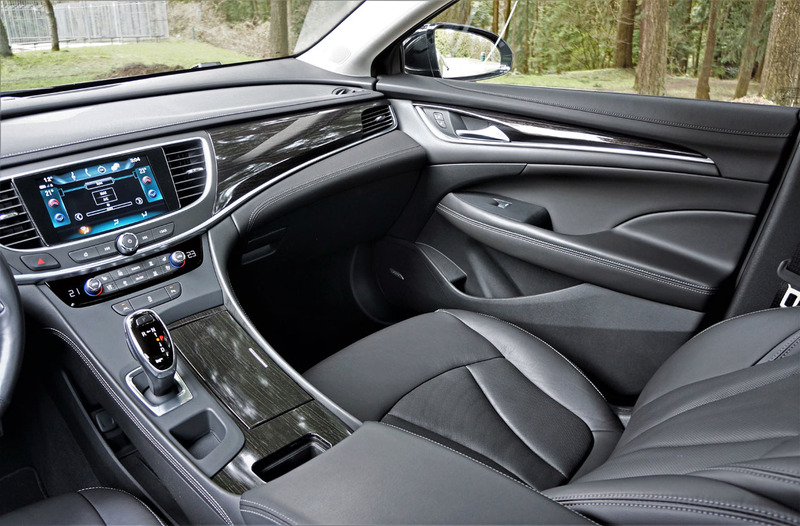 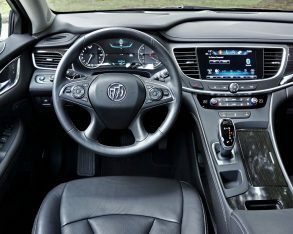 LaCrosse tester was finished in top-of-the-line Premium trim, which moves the price up from a base of $37,295 to $46,900, plus for an extra $2,450 it was upgraded with AWD. 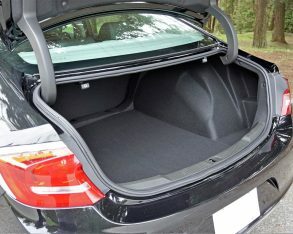 That comes to $49,350 before freight and fees, which is pretty incredible value for everything you get. 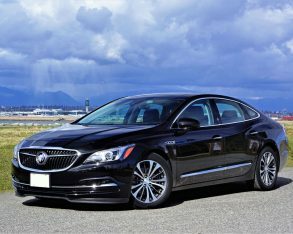 The base LaCrosse is actually priced lower than Toyota’s flagship Avalon in its entry-level trim, yet this top-tier 2017 Buick LaCrosse Premium AWD model costs considerably more than the fully loaded Toyopet due to its many more features. 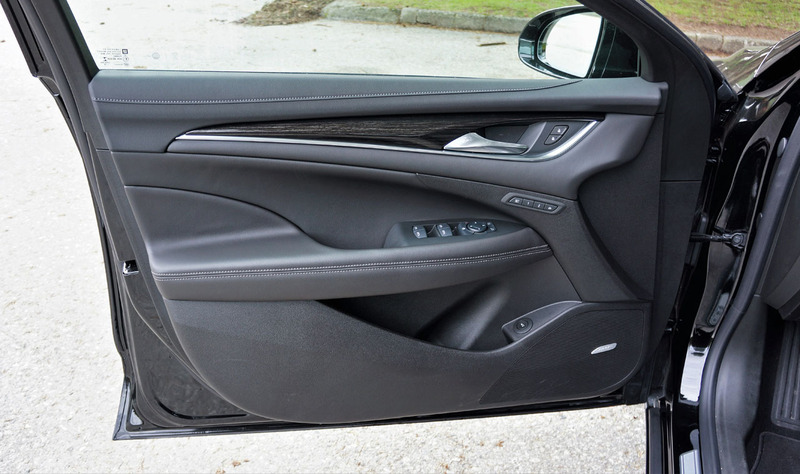 Alternatively, if you still want to step up to an ES 350 you’ll need to add a few thousand loonies to the finally tally, plus you’ll be forced to remove a number of fine features from its roster. 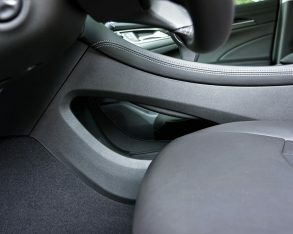 shares the same underpinnings, leaves me rather flat. 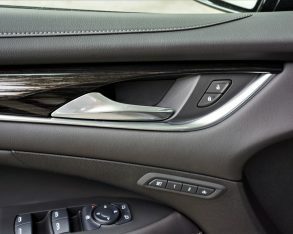 I choose them for comparison because both have earned respect in the industry, while the Lexus has even enjoyed best-selling status in years’ past, so if you don’t mind I’ll continue along this vein for a bit longer. 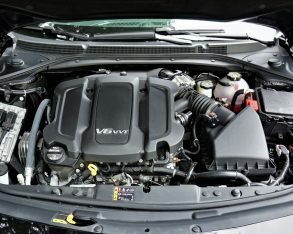 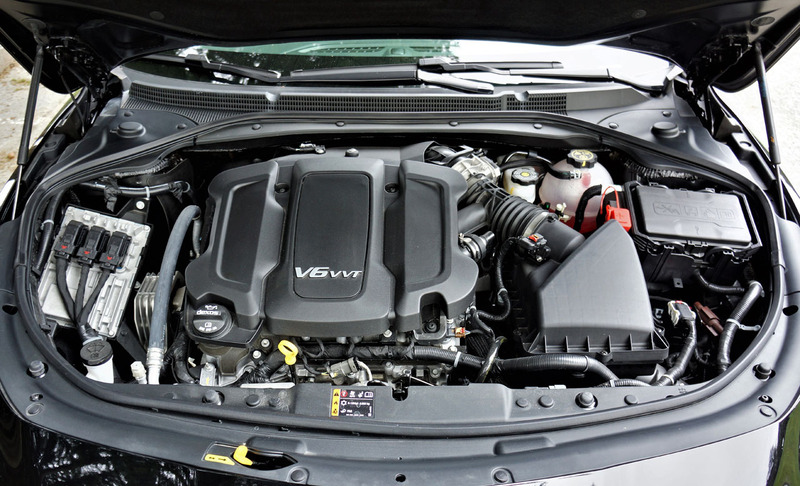 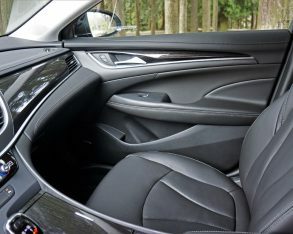 The Avalon and ES 350 share the same 268 horsepower 3.5-litre V6 with 248 lb-ft of torque, as well as identical six-speed automatic transmissions with shift lever-actuated manual mode, plus Toyota’s large mid-size front-wheel drive architecture, whereas Buick steps things up a significant notch thanks to a 3.6-litre V6, this powertrain boasting 310 horsepower and 282 lb-ft of torque, a more sophisticated eight-speed automatic with sportier steering wheel-mounted paddle-shift actuated manual mode, and in the case of my tester, all-wheel drive. 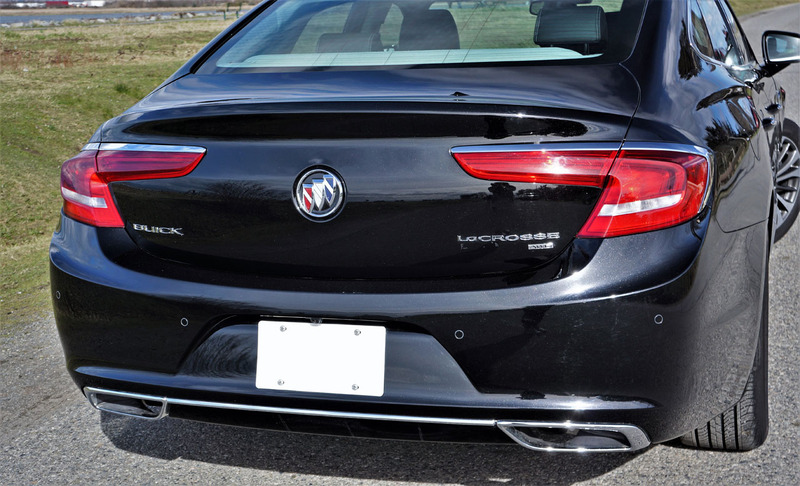 The LaCrosse definitely has the advantage in the performance department. 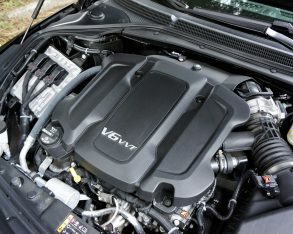 I’m tempted to delve deeper into this comparo I’ll leave it there for now, because pulling the Avalon and ES 350 into every aspect of this review would force me to do likewise with all the other near full-size mainstream and mid-size E-segment luxury challengers it competes against, the list also including Kia’s Cadenza amongst volume brands, and Genesis’ G80 (previously Hyundai’s Genesis sedan), Infiniti’s Q70, Lincoln’s MKZ, Cadillac’s CTS and newer, larger CT6, Lexus GS’, Jaguar’s XF, Audi’s A6, BMW’s 5 Series, and Mercedes’ E-Class on the higher end of the scale. 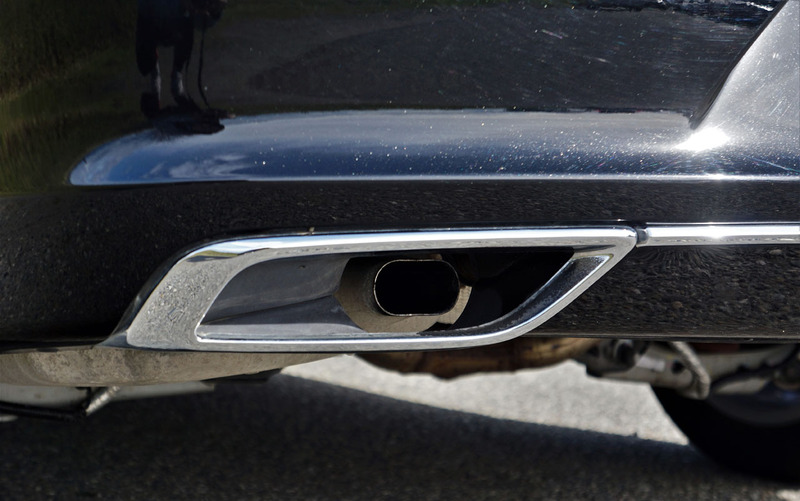 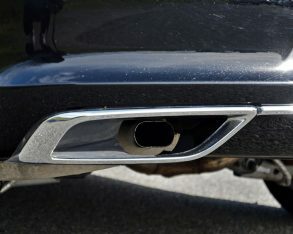 harmful emissions, while its list of standard features fits more easily within the group of flagship mainstream models, with exterior items including 18-inch alloys on 235/50 all-seasons, active grille shutters, auto on/off articulating HID headlamps, halogen fog lamps, heated and powered side mirrors with integrated LED turn signals, noise, vibration and harshness reducing laminated acoustic glass for the windshield and front-side windows, and a handy remote engine starter. 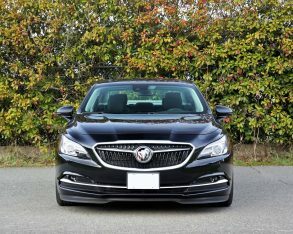 leatherette upholstery, rear parking sensors, and the fuel-saving auto start/stop system noted earlier, which helps the big Buick achieve a fairly thrifty claimed 11.2 L/100km in the city and 7.5 on the highway. 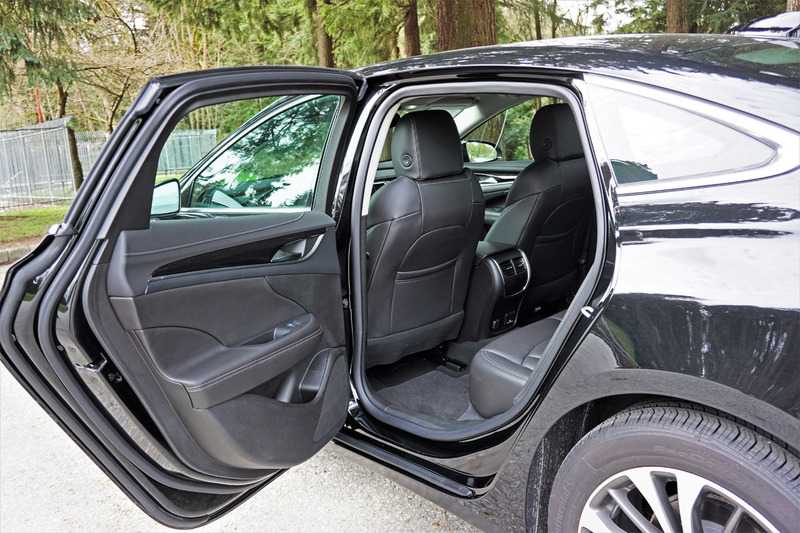 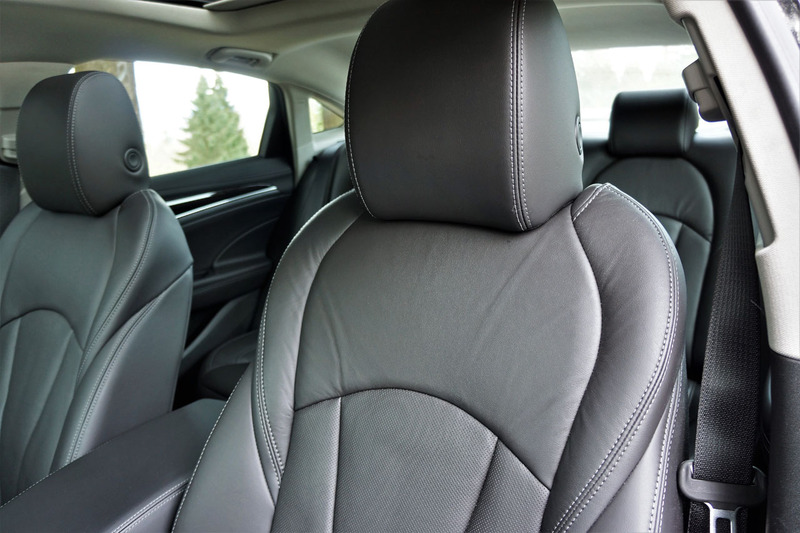 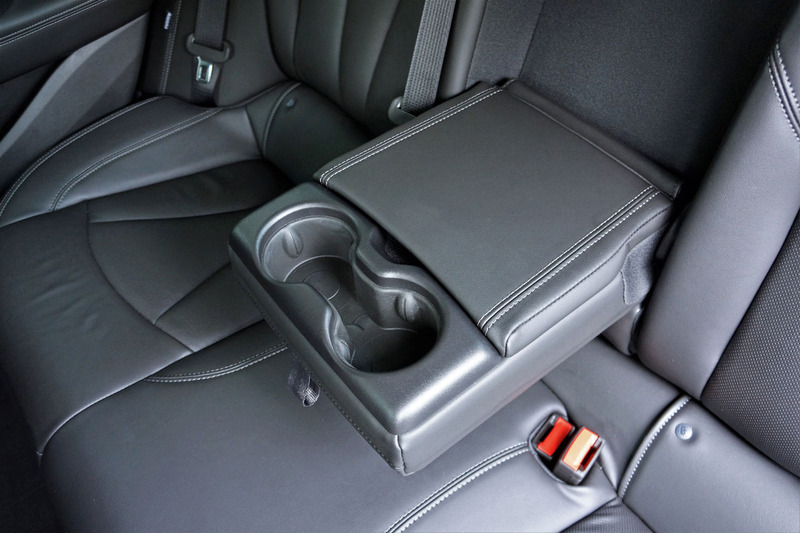 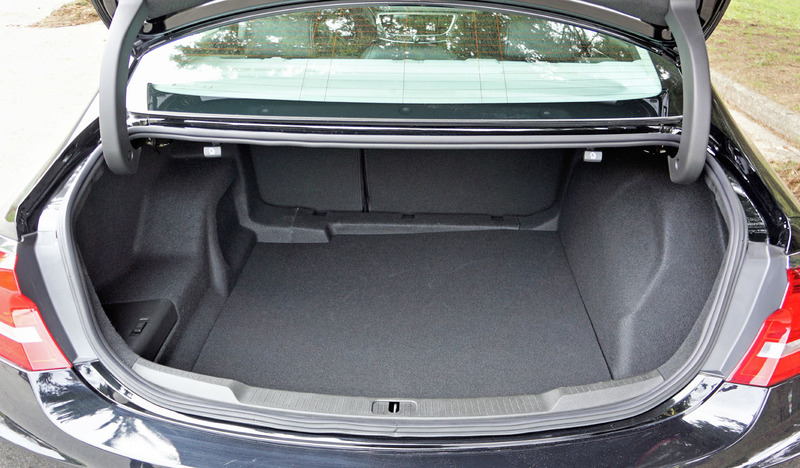 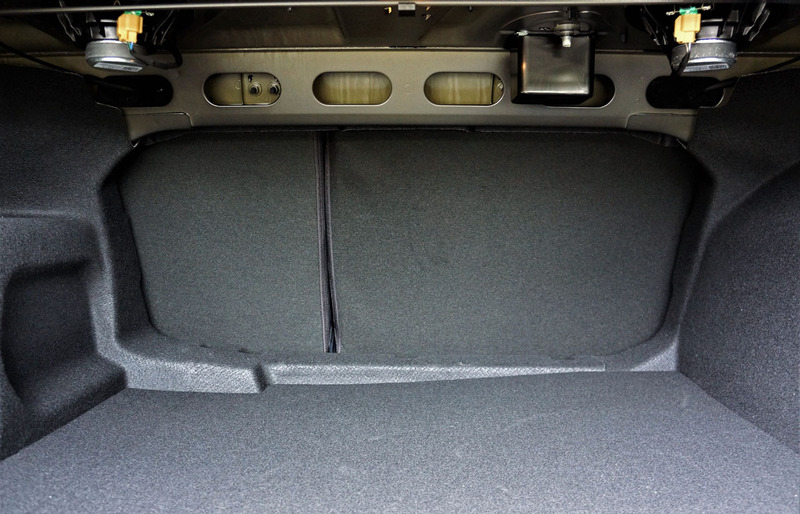 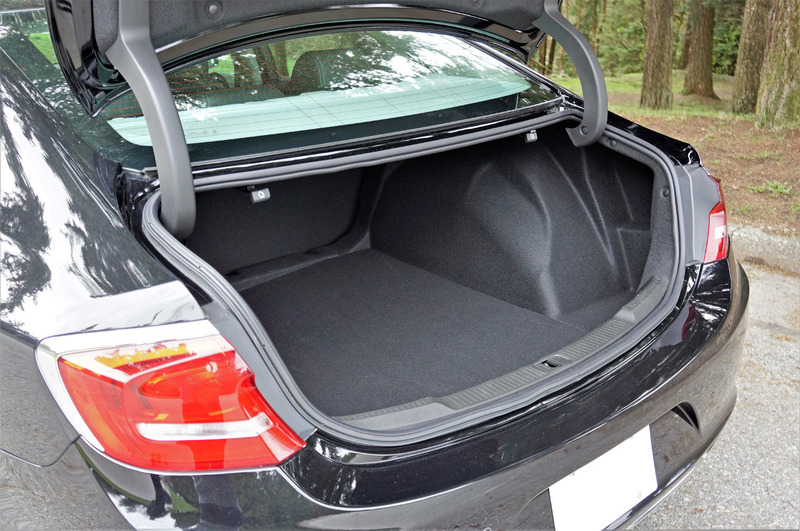 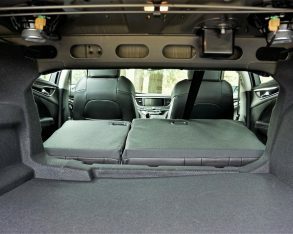 Standard safety items include all the usual active and passive features plus a teen driving mode, tire pressure monitoring, and 10 airbags comprising an unusually welcome set of side-thorax bags for rear window seat passengers and knee airbags for both front occupants. 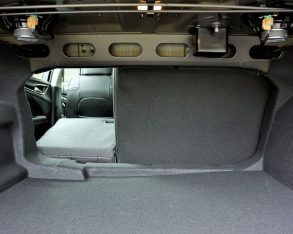 18-inch alloys, a powered tilt and telescopic steering column, satellite radio, a cargo net, an emergency tool kit, and the ability to upgrade further with options packages, while the Essence Group adds supple perforated leather upholstery, heatable front seats, two-way powered lumbar for the front passenger, driver’s seat and side mirror memory, auto-dimming side mirrors, wireless device charging for that new iPhone X you’ve got your eyes on (I’m going for the Samsung Note 8 when its price drops a little), and yet more option packages. 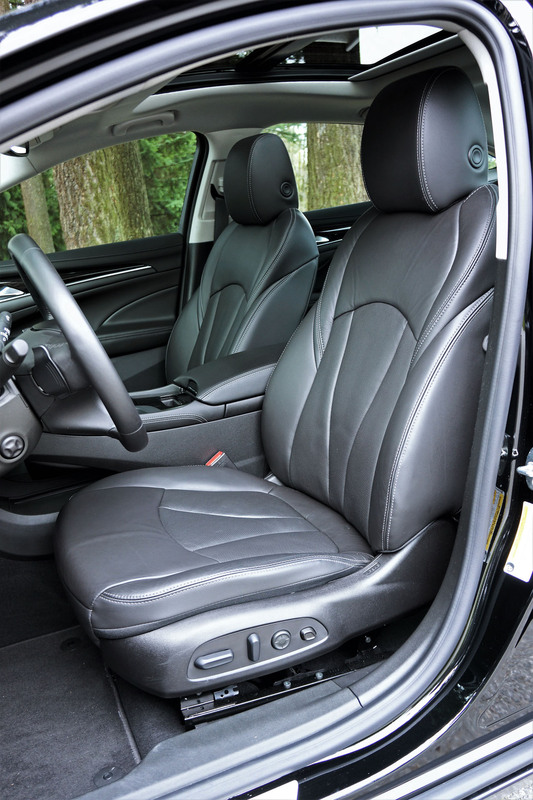 rim, a soothing back massager within the already comfortable driver’s seat, which also gets upgraded with four-way powered lumbar support. 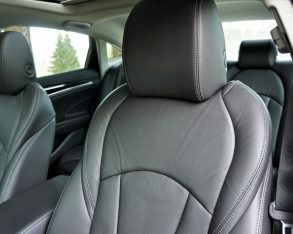 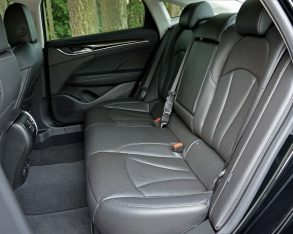 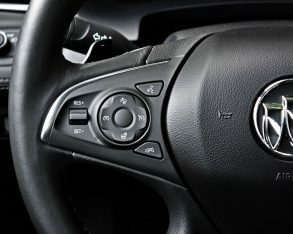 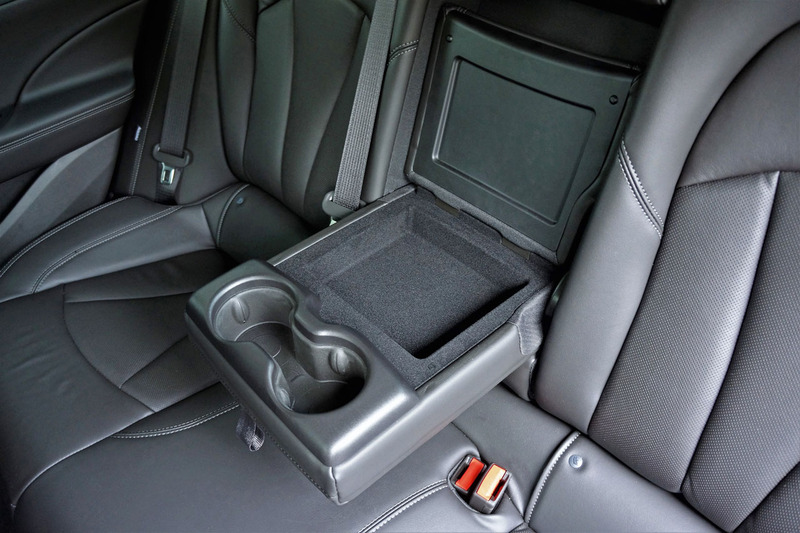 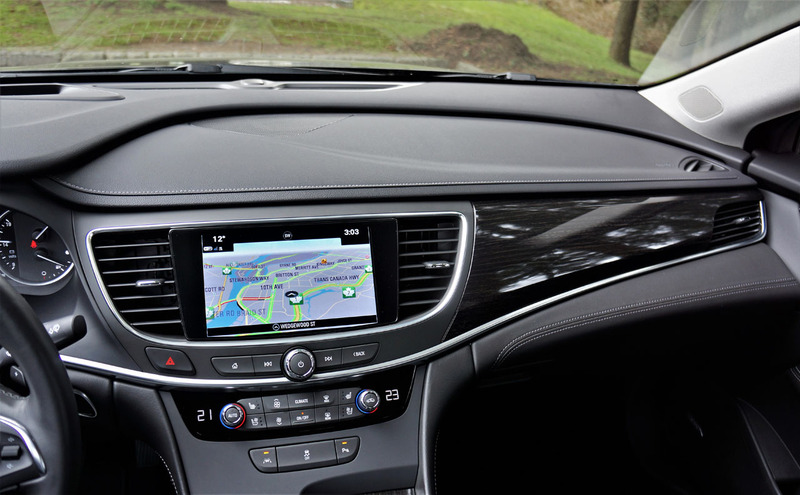 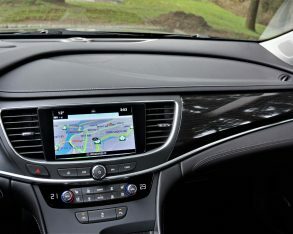 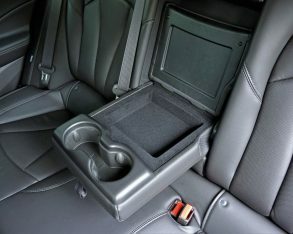 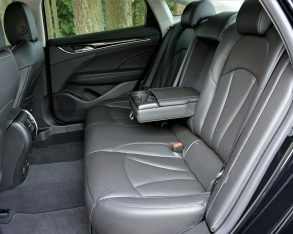 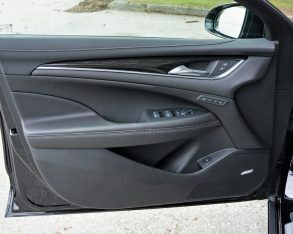 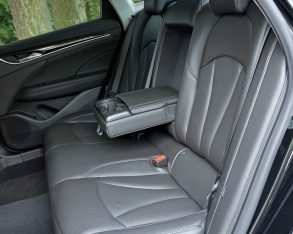 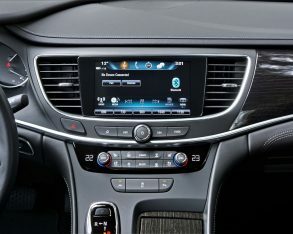 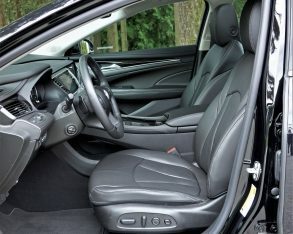 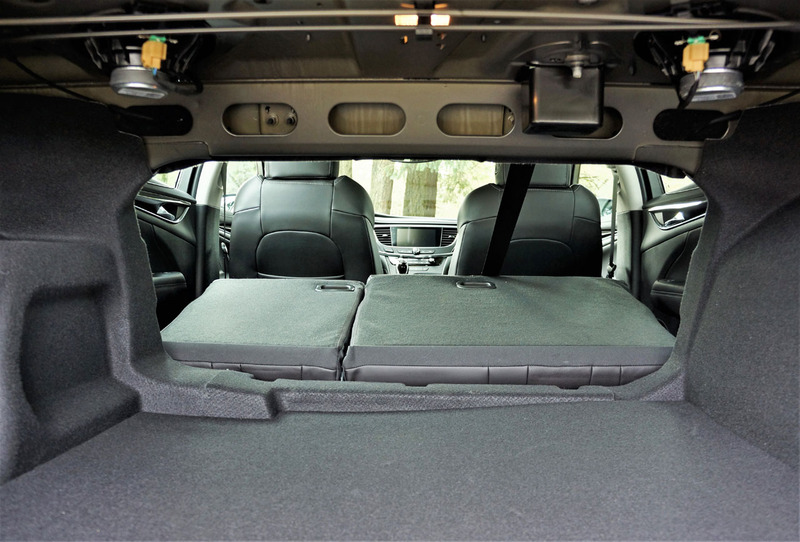 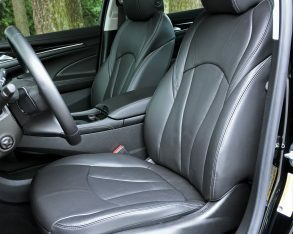 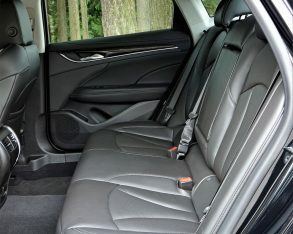 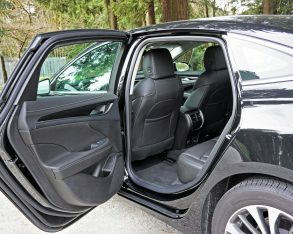 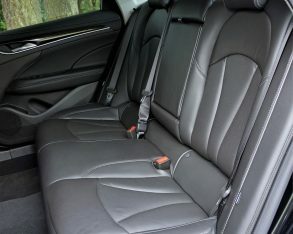 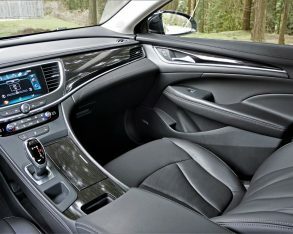 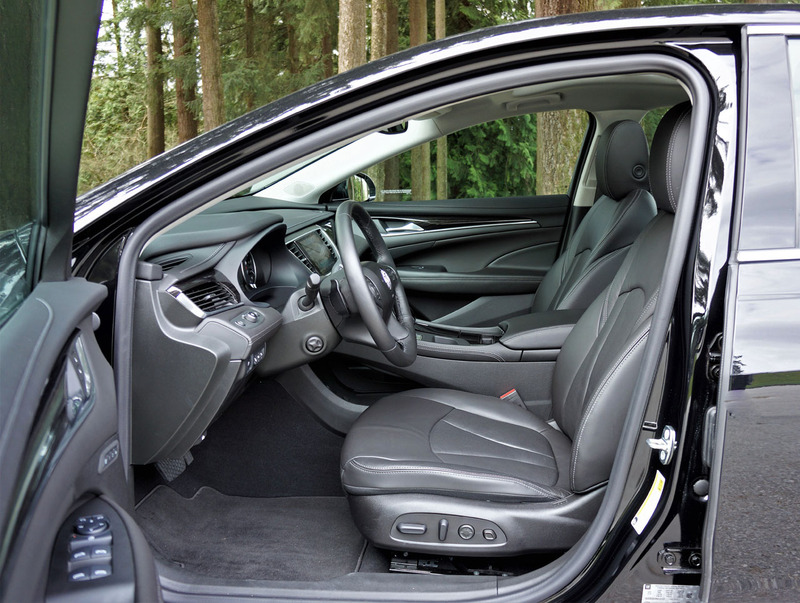 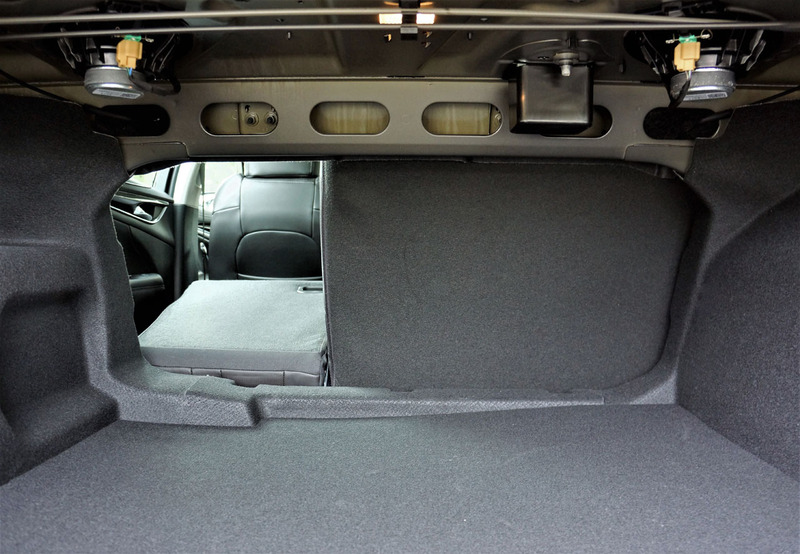 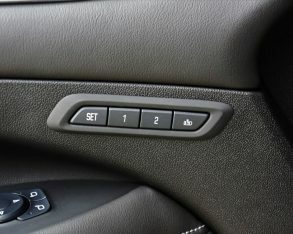 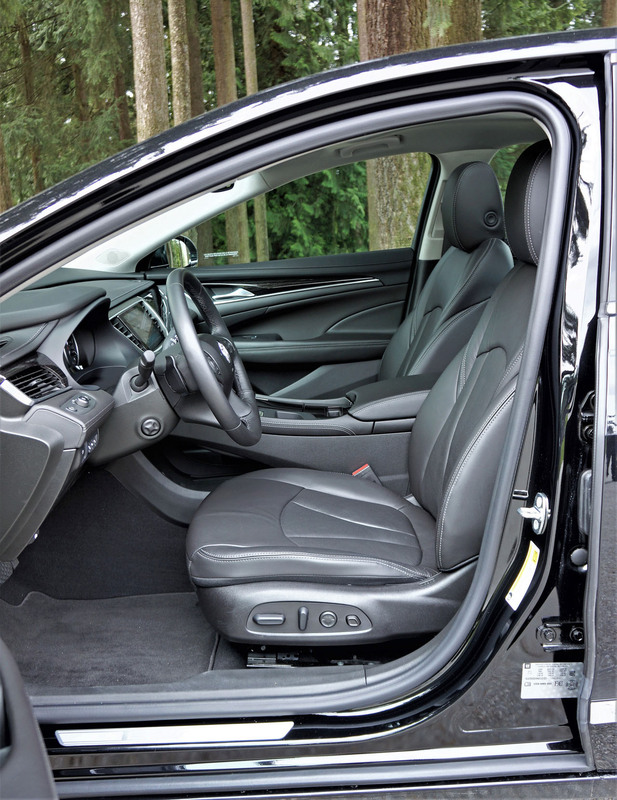 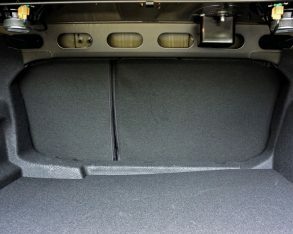 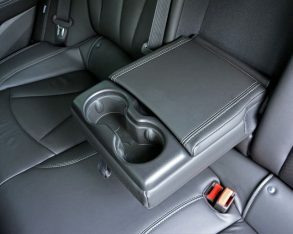 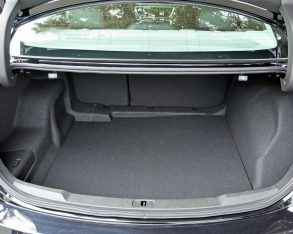 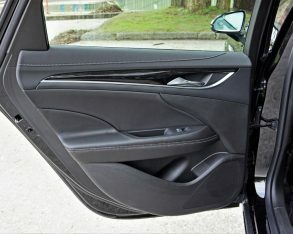 The list of Premium goodies continues with forced ventilation for both front seats, as well as a household-style three-prong 120-volt power outlet, storage within the folding rear armrest, plus Buick’s Driver Confidence Package #1 that includes blindspot monitoring with rear cross-traffic alert and lane change alert, forward collision alert, a following distance indicator, lane keep assist, and a safety alert driver’s seat. 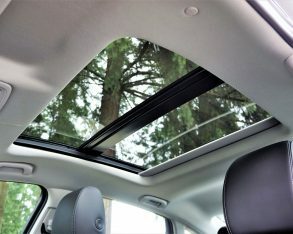 parallel and perpendicular self-parking, some of these features earning it a Top Safety Pick from the IIHS (it’s best possible NHTSA 5 Star status covers all trim levels); while the $2,135 Sun and Shade package adds a powered panoramic sunroof and a powered rear sunshade; and finally the $1,450 Sights and Sounds package features navigation with mapping, plus fabulous sounding Bose Centerpoint Surround Sound audio. 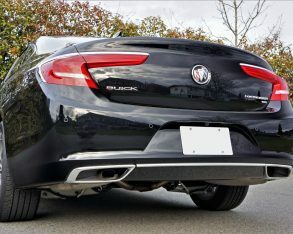 a driver selectable Sport mode and continuously variable real-time damping (I’d like to take this one for a spin); $230 sport pedals; a $425 rear spoiler; a $245 Buick Interior Protection Package featuring all-weather floor mats and a cargo mat; a $150 engine block heater; and more. 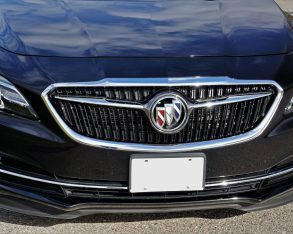 As it is, my tester came to $53,145, not including freight, dealer fees or taxes, which while slightly higher than the price noted earlier still represents very good value for what you get. 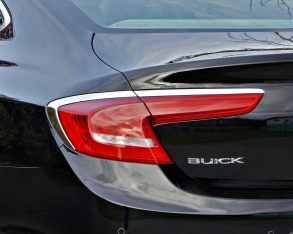 Of course, it can only be considered good value if Buick stuffs all this impressive kit into a car that’s on par or better than the majority of models mentioned earlier, and while it might still want to shy away from the old-school premium European brands when it comes to eye-popping interior design and materials quality used for some surfaces, in many respects it measures up to these highfalutin types, and in many more exceeds its mainstream flagship rivals. 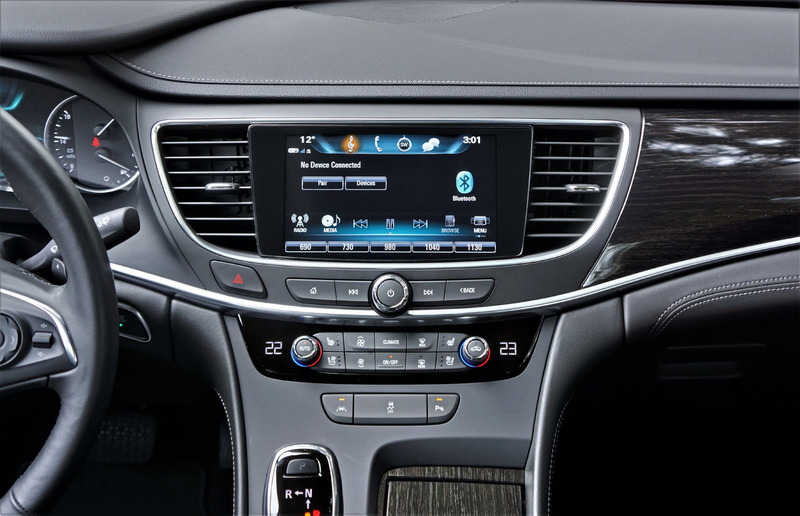 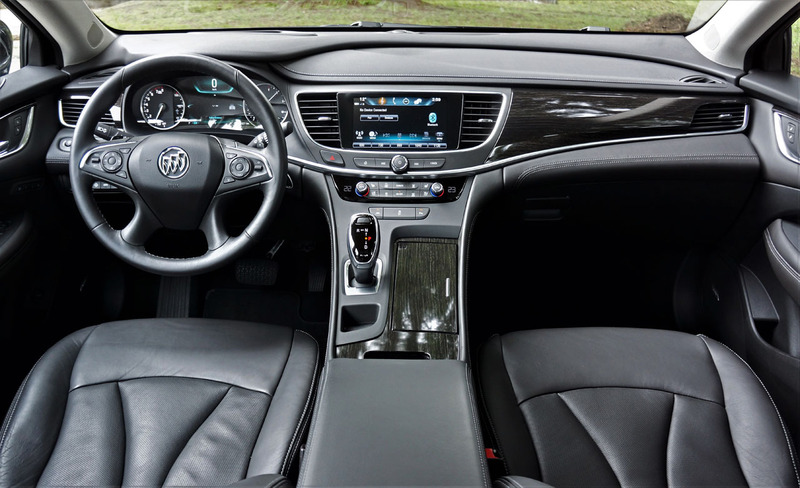 Buick has created a nicely laid out, attractively designed interior with a good balance of traditional and modern elements. 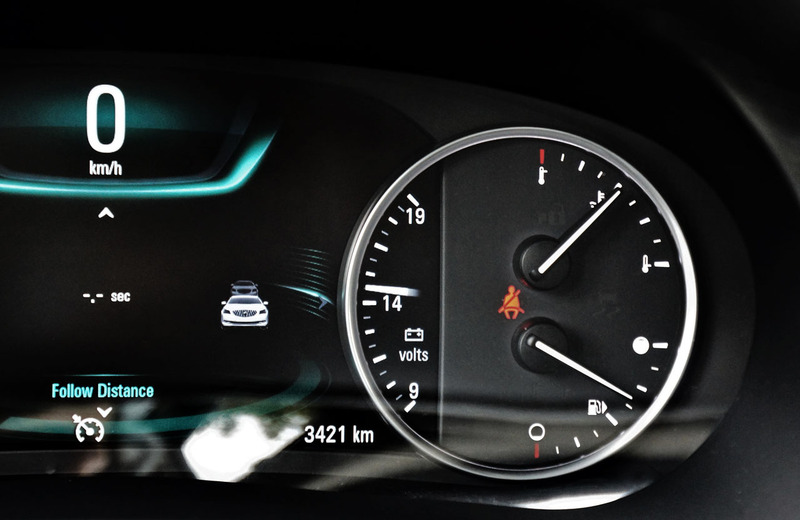 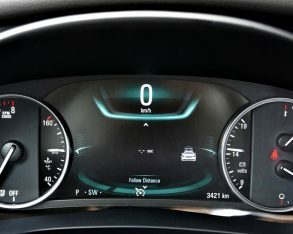 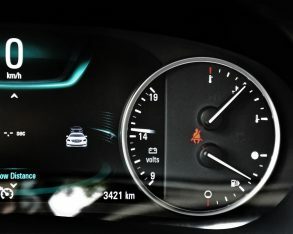 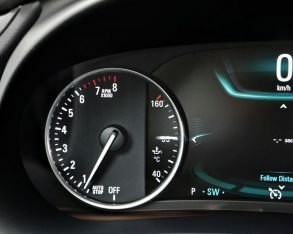 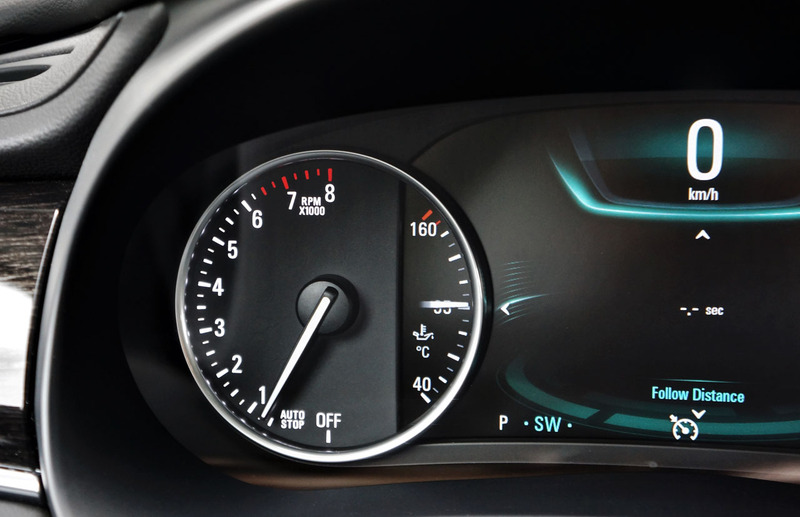 The gauge cluster is half digital, half analogue, the otherwise blacked out aluminum-ringed primary dials coming alive at startup, while the ancillary gauges, for temperature and oil, appear separate from the large colour TFT display at centre, but are really just clever optical illusions. 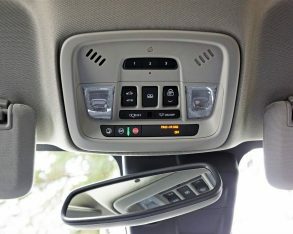 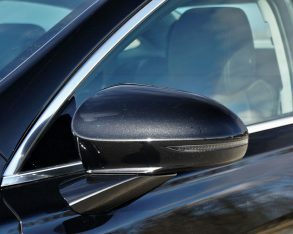 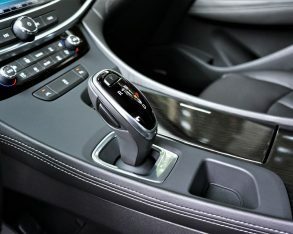 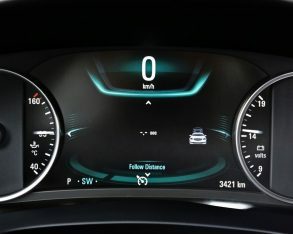 another that attempts to make you drive more carefully, while the list of functions continues with tire pressure monitoring, remaining oil life, fuel range, dual trip computers, HVAC information, dynamic cruise control, a timer, etcetera. 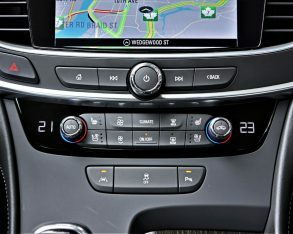 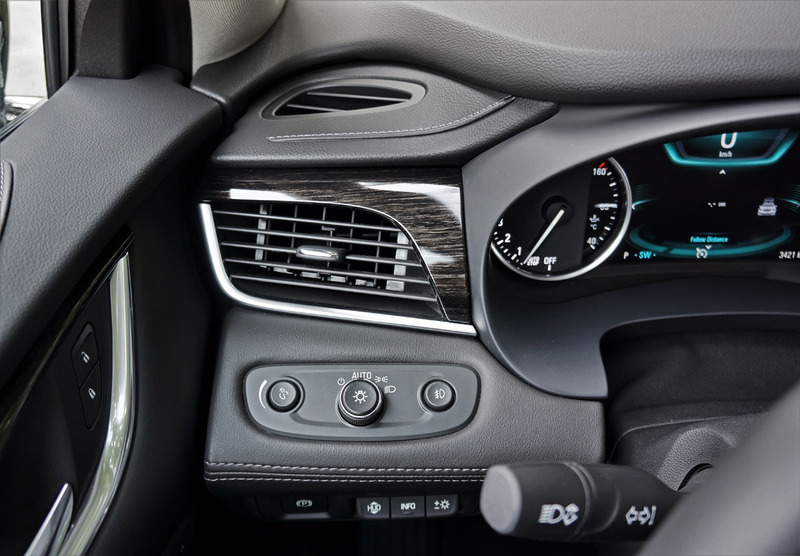 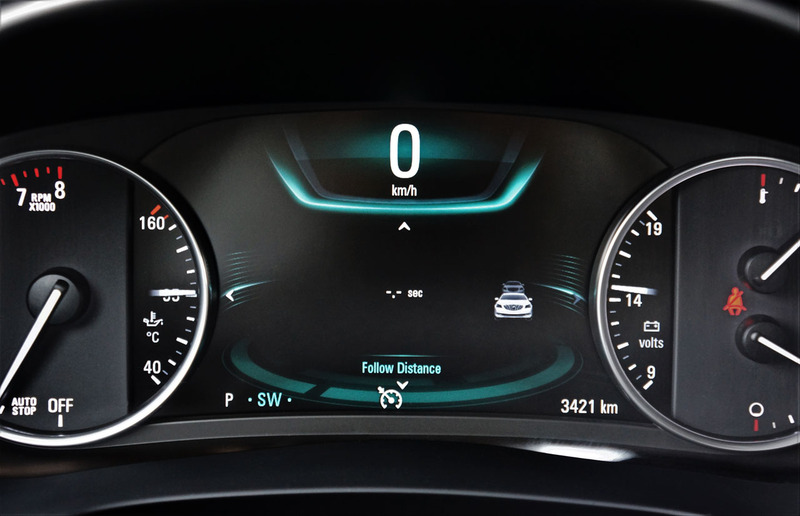 They’re all controlled via smartly laid out matte black switchgear on the right steering wheel spoke, while the buttons and toggle on the left side are for the heated steering wheel, autonomous driving features, audio, phone, and voice activation. 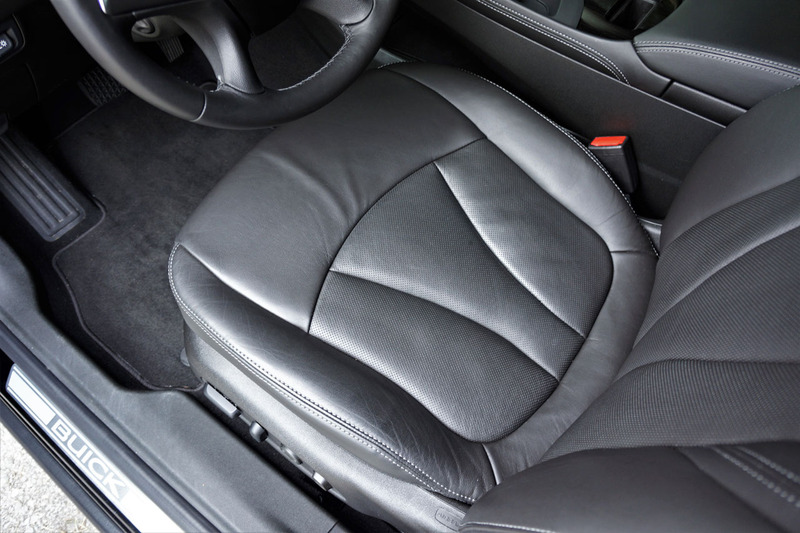 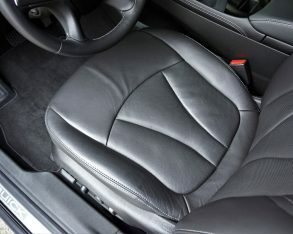 The steering wheel rim is nicely shaped too, and wrapped in soft high-grade leather, just like the seat bolster upholstery. 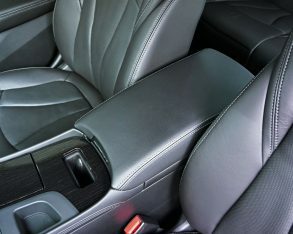 stack and lower console, these also French-stitched like the armrests and seat bolsters. 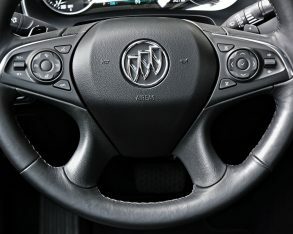 Buick goes a step further by adding some tastefully applied stitched leatherette panels to the dash top, door uppers, and instrument panel too, giving my LaCrosse a custom bespoke look and feel, while attractive woodgrain crossed the dash, door panels and centre console, along with satin-finish aluminum trim. 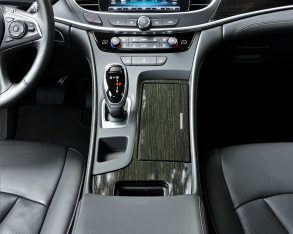 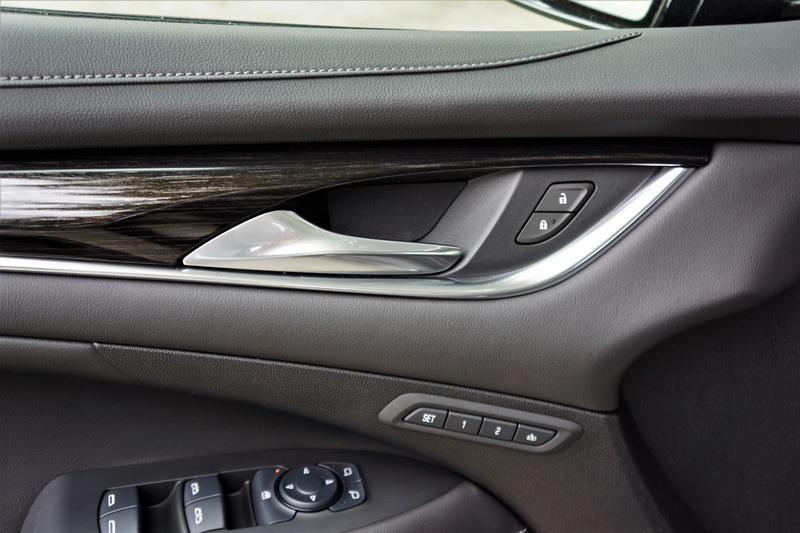 The wood and metals look very upscale and feel quite substantive, but it’s not quite in the same league as with premium models from Audi, BMW, and Mercedes-Benz. 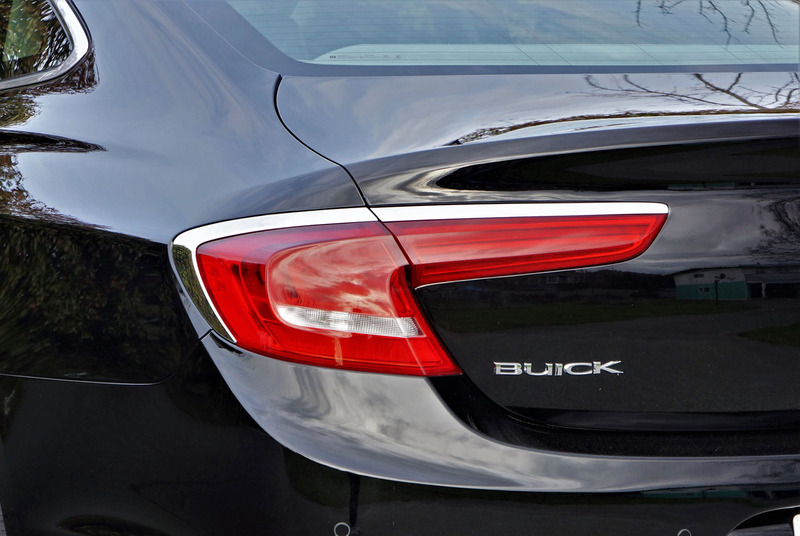 Of course, it’s not priced anywhere near as high either, so we need to give Buick some slack. 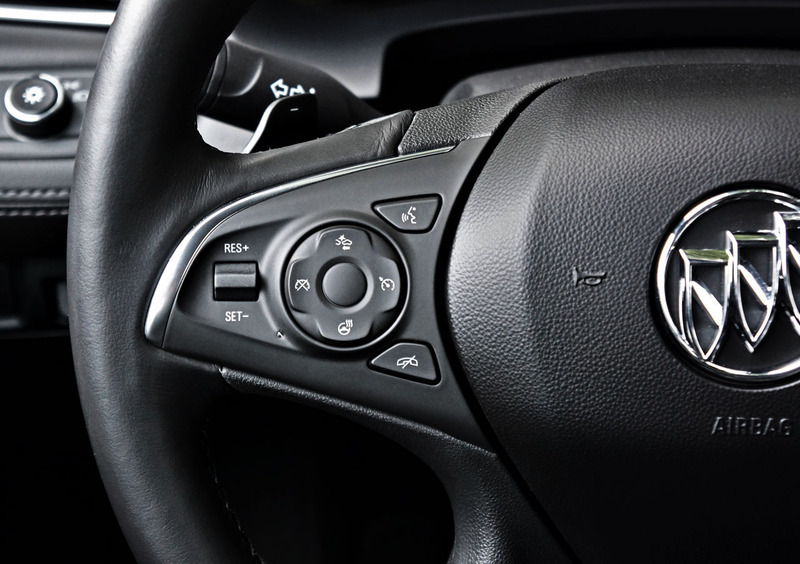 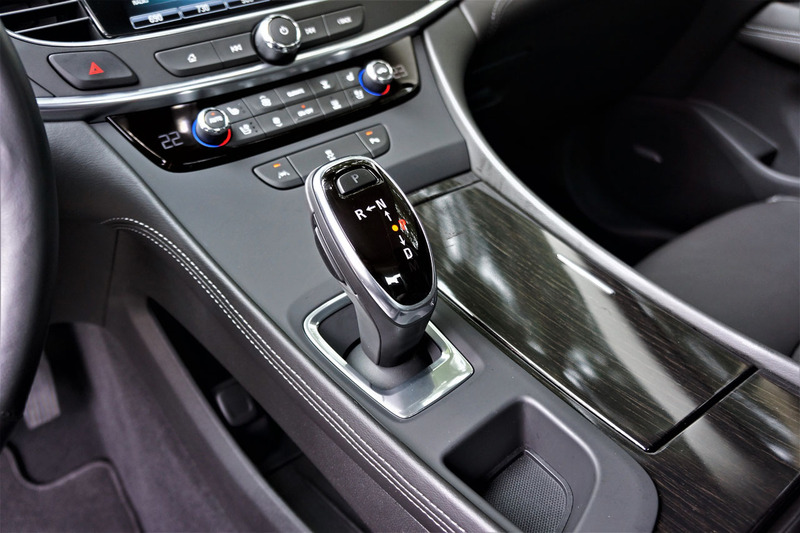 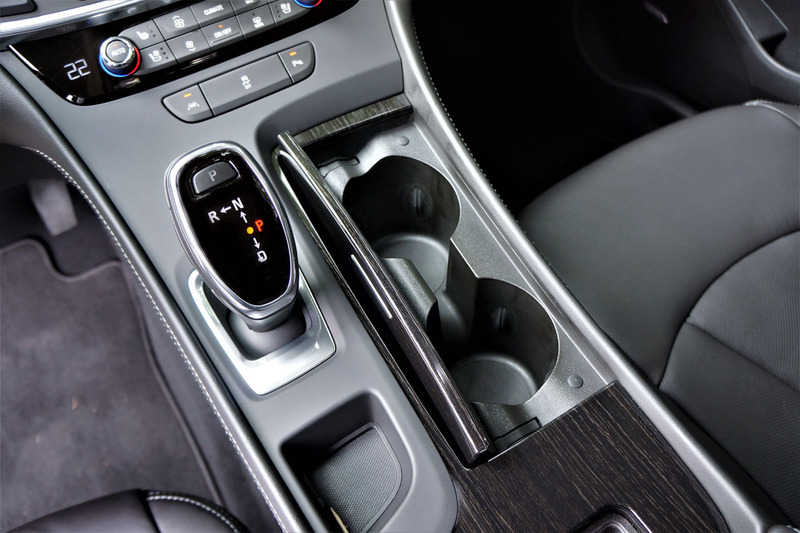 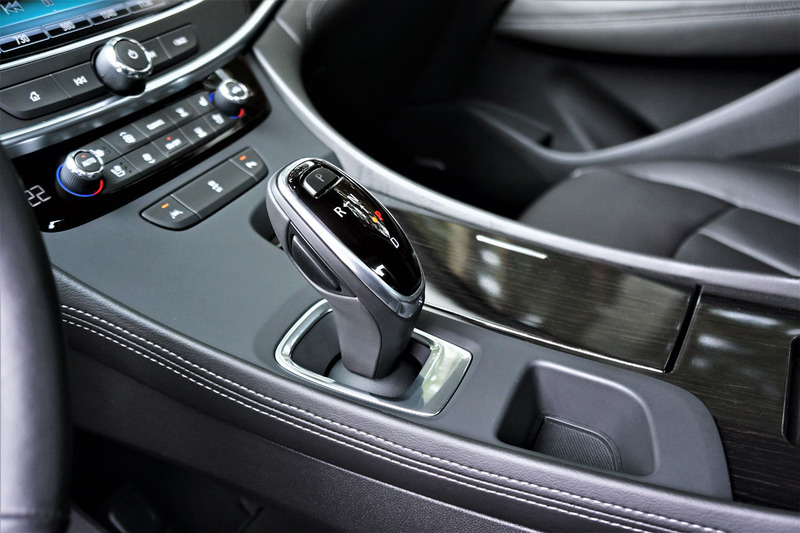 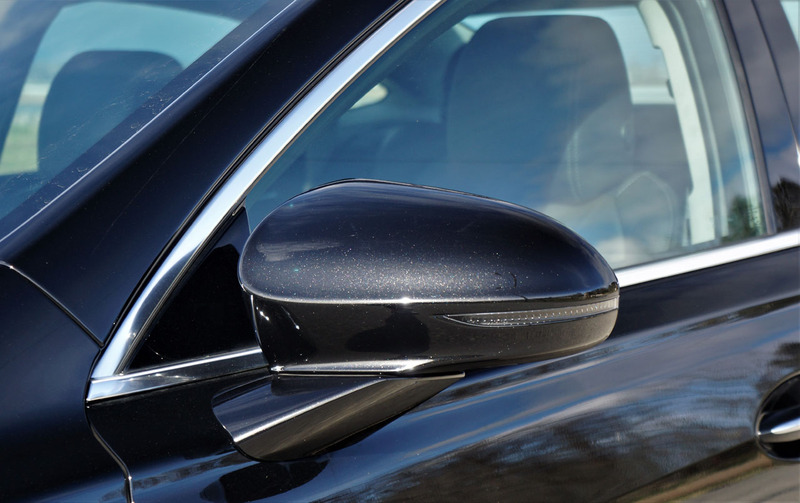 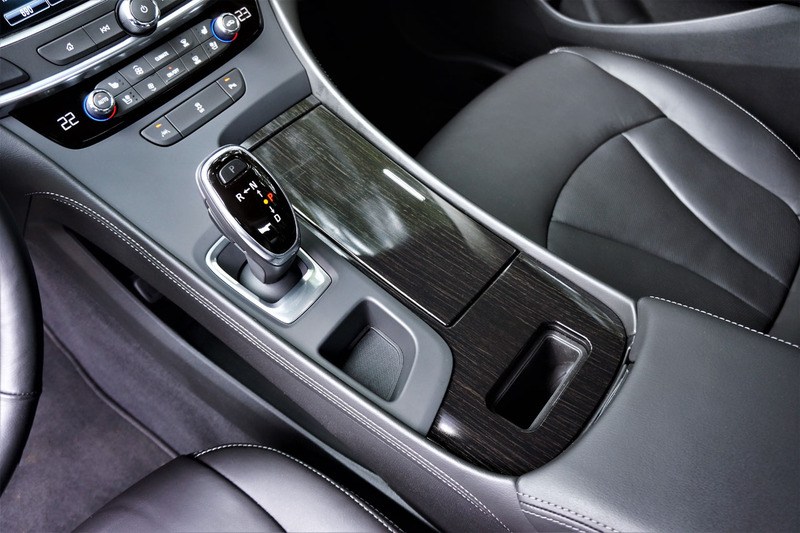 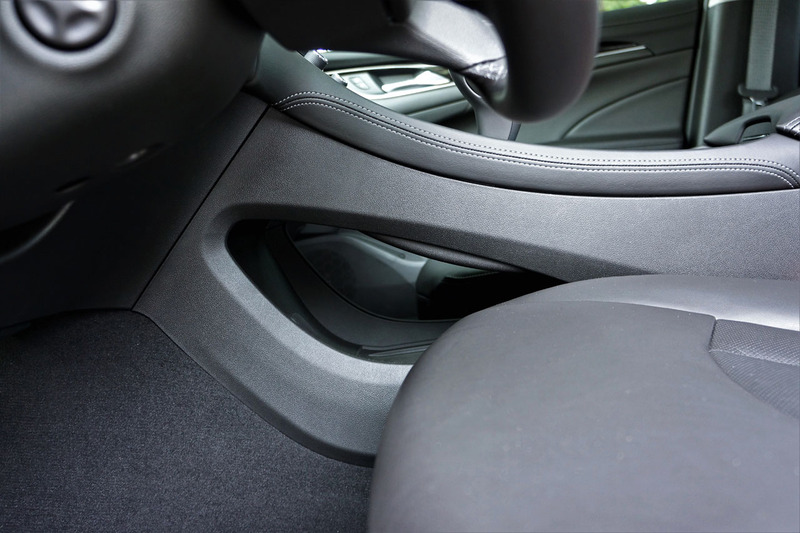 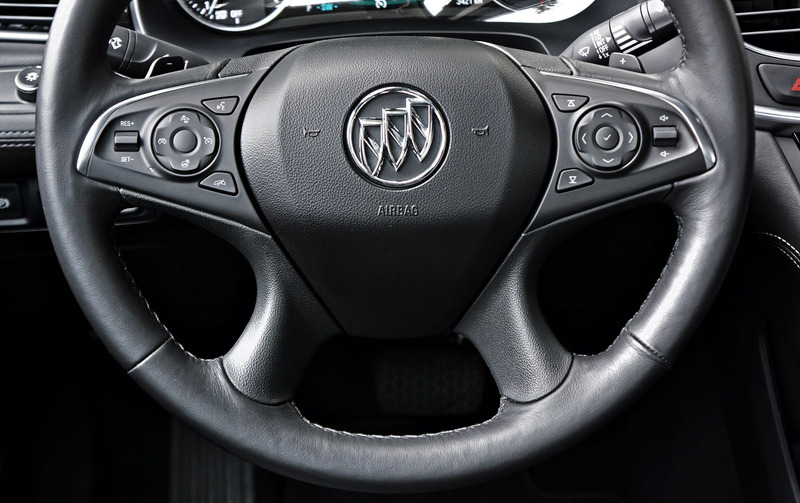 Likewise, the LaCrosse’ steering wheel stalks are a bit commonplace, while the rest of the switchgear is tightly fitted and well damped, but not made from the industry’s highest quality composites. 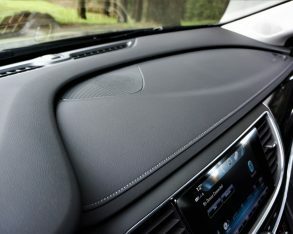 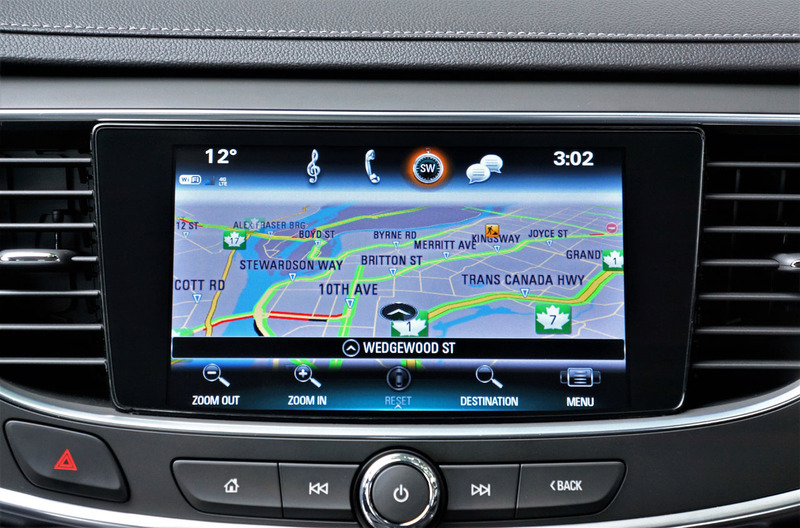 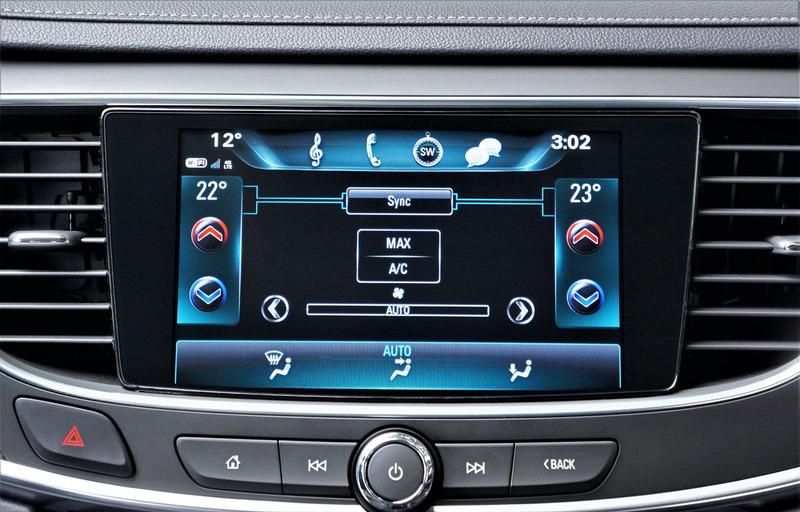 It all works well, however, including the superb infotainment touchscreen on the centre stack. 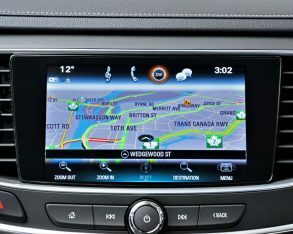 Buick IntelliLink interface is much like the Chevrolet MyLink system and others within GM’s multi-brand lineup, although it’s not quite as bright and colourful, nor as Apple iPhone-inspired as Chevy’s display, but it nevertheless works very well thanks to great audio controls, easy-to-set-up phone functions, an accurate navigation system with very detailed mapping, an extremely clear reverse camera with those handy active guidelines noted earlier, another camera for forward viewing, hands-free text messaging and email reading/responding functionality, auto climate control settings, OnStar, and much more. 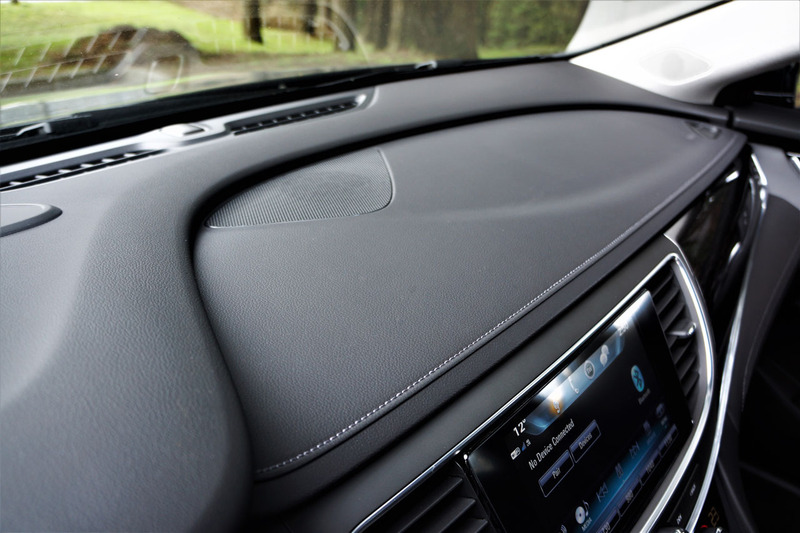 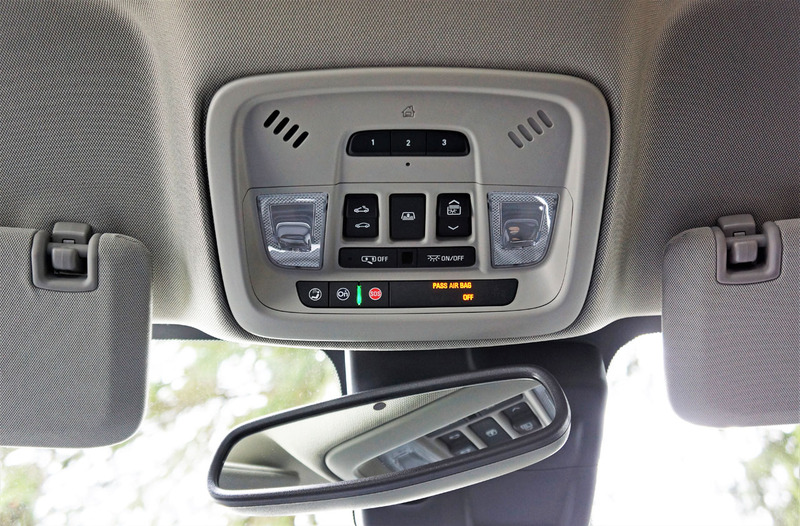 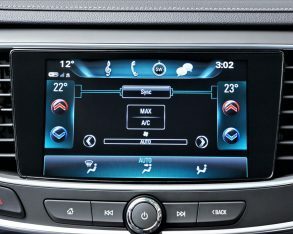 A straightforward HVAC interface sits just below, including dual-zone auto controls, buttons for the three-way heatable and cooled front seats, and a really handy quick access “CLIMATE” button that puts all of the above and more on the infotainment screen. 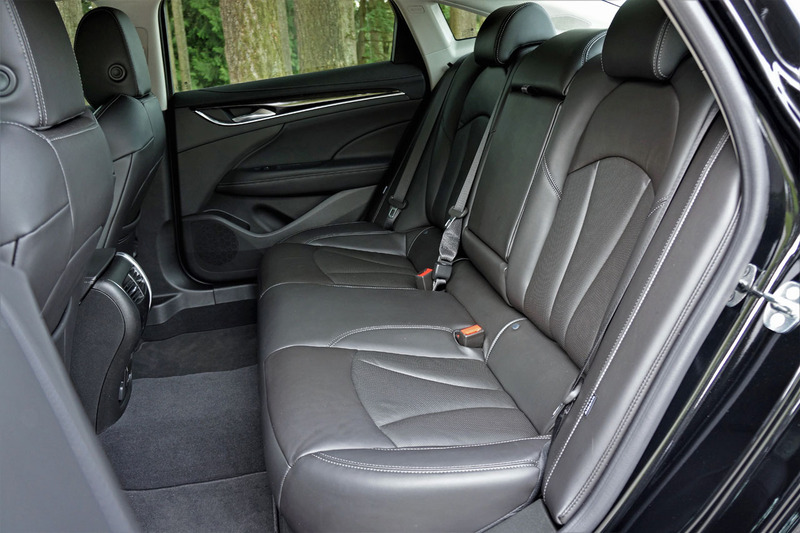 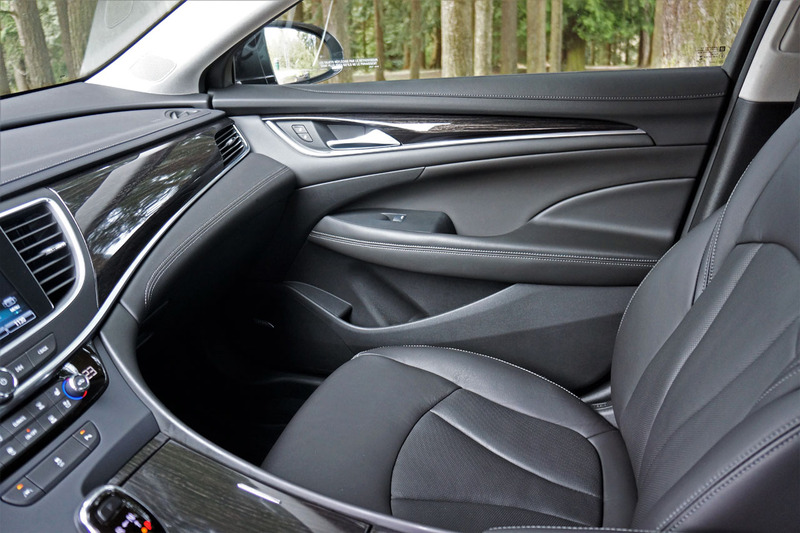 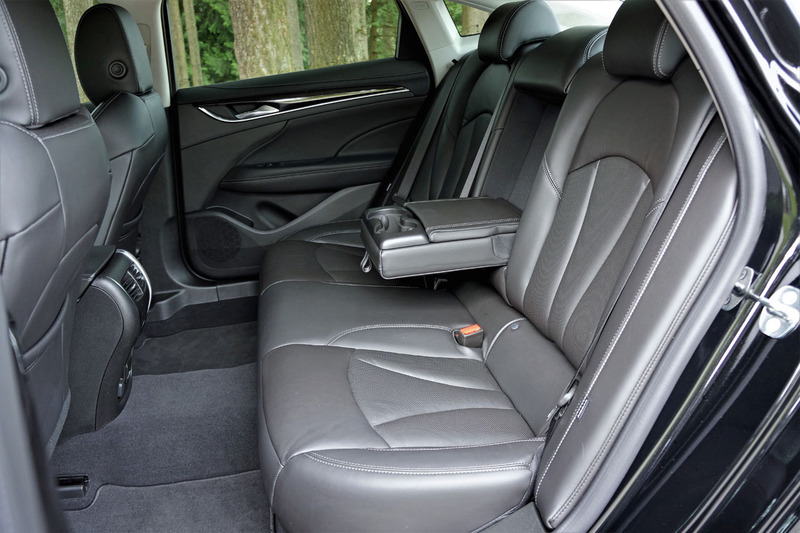 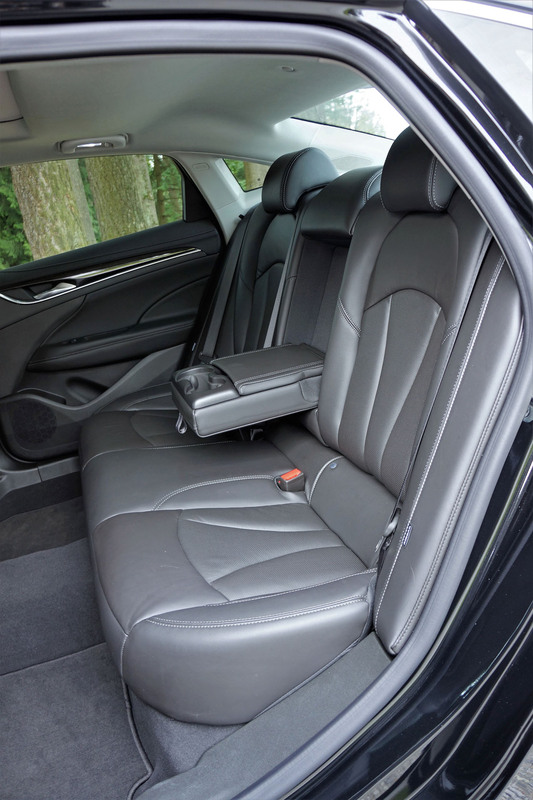 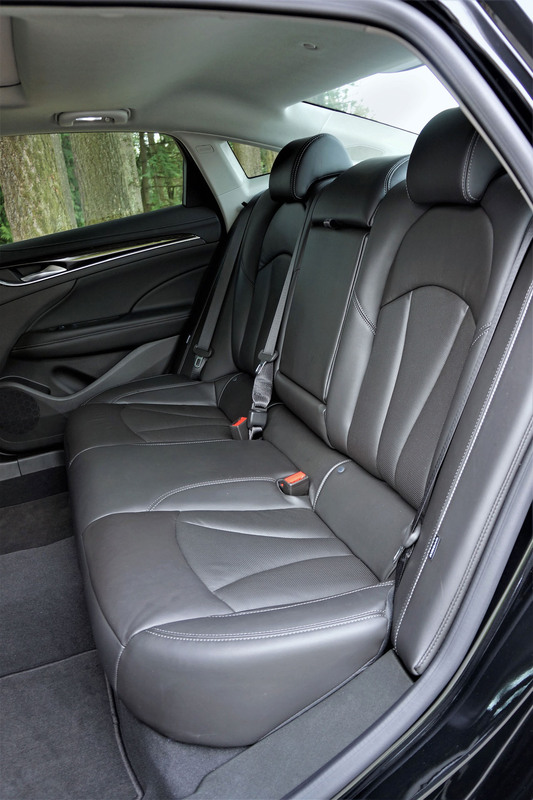 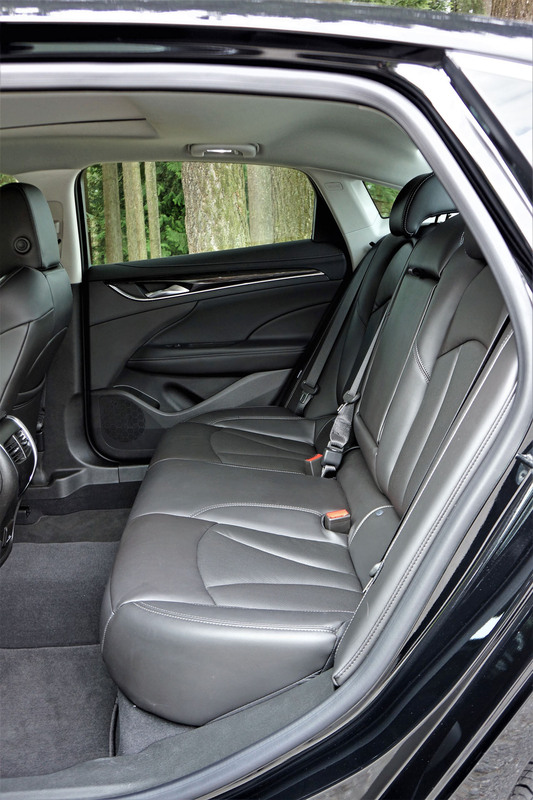 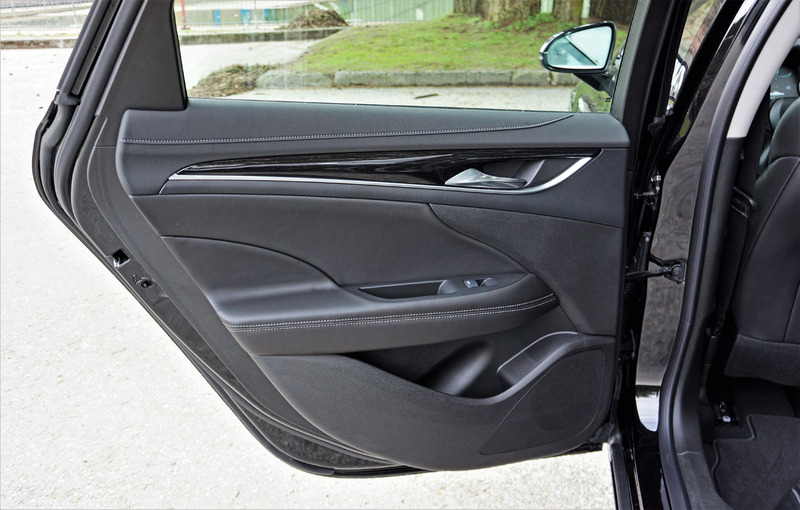 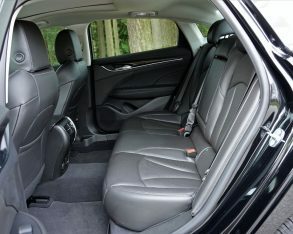 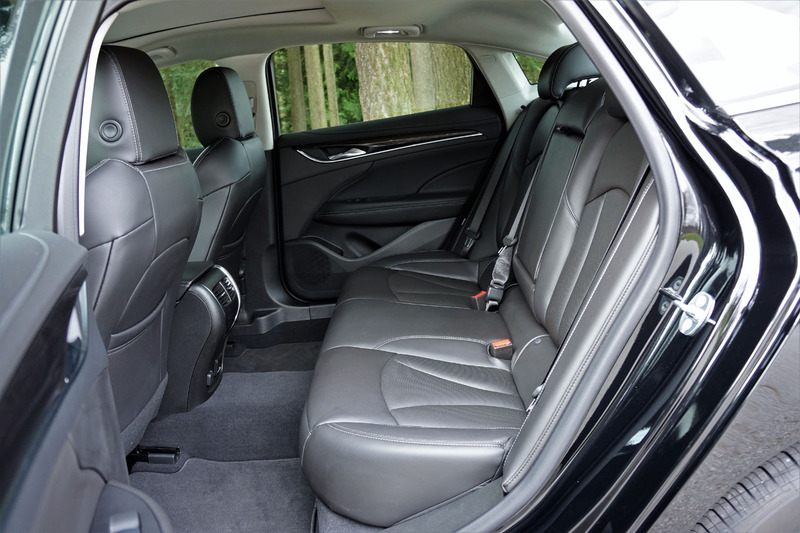 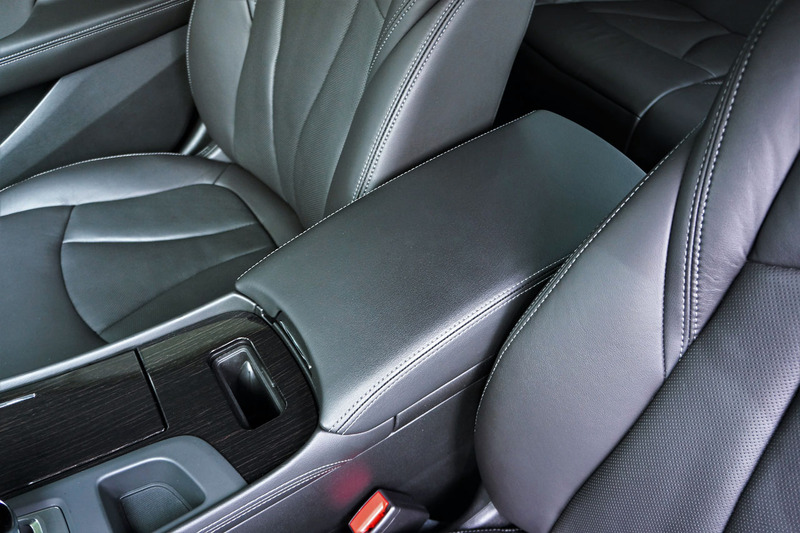 the front seats are especially comfortable, but they’re also housed in a large and spacious luxury car cabin that should be sizeable enough for most any driver and passenger, while the rear seating area is at least as expansive, especially for foot space and legroom. 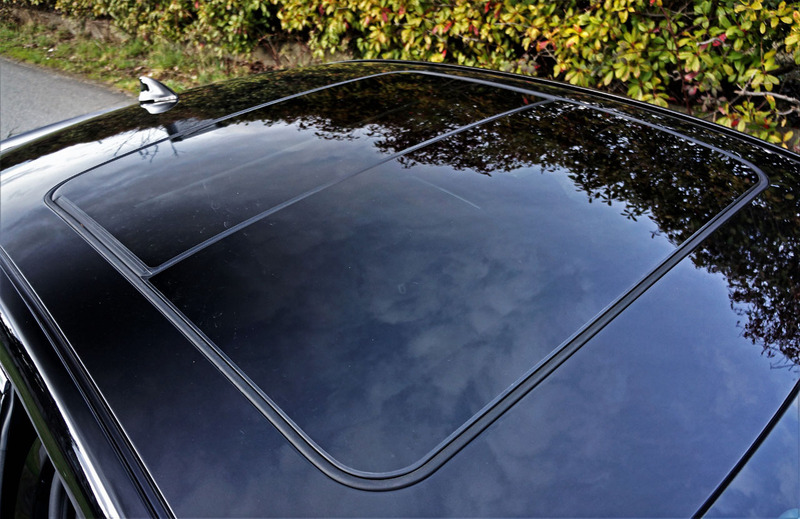 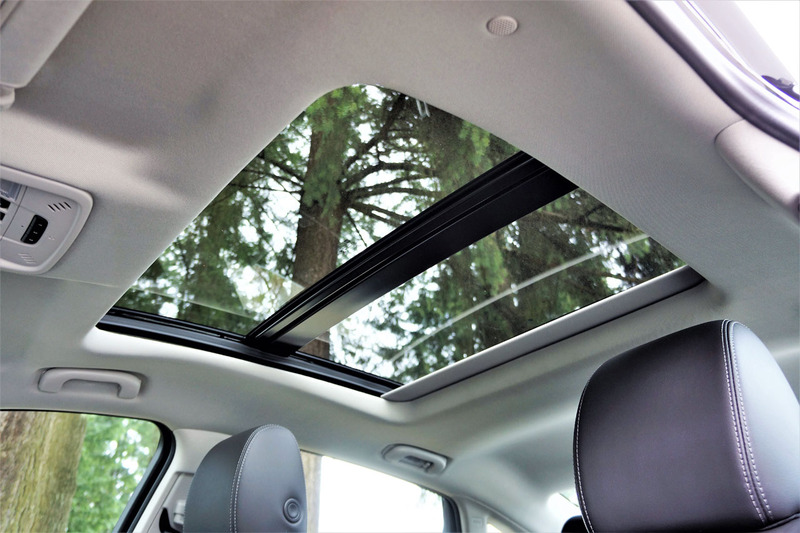 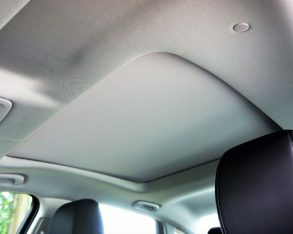 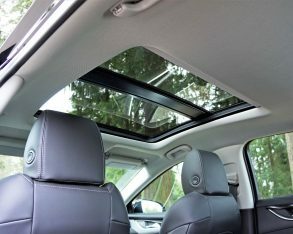 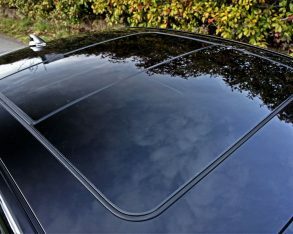 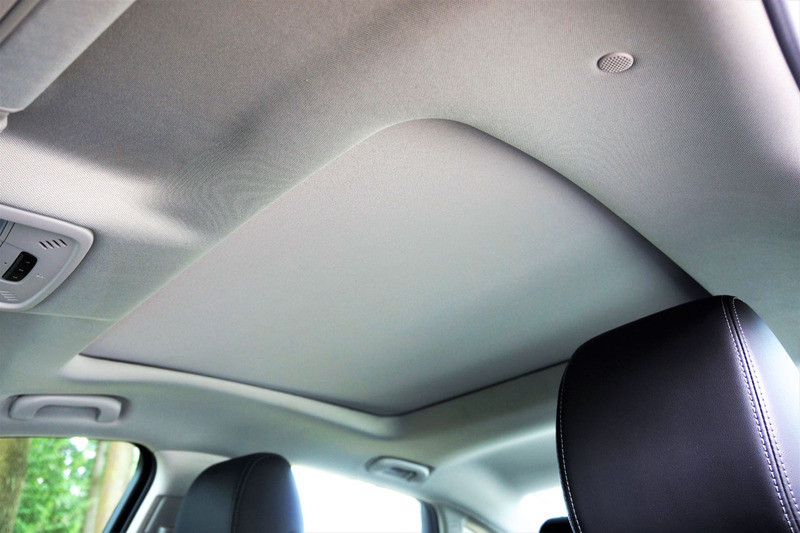 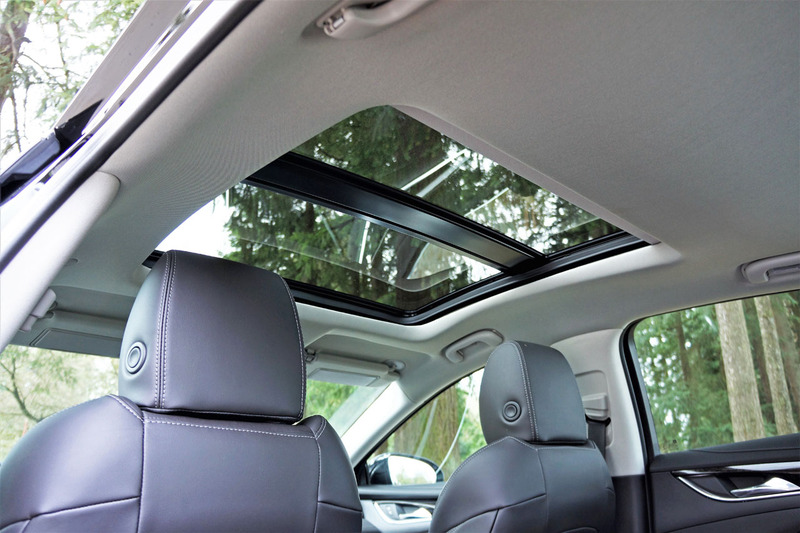 The previously mentioned panoramic sunroof adds to the feeling and reality of spaciousness, a couple of extra inches of headroom included when upgraded to this feature, but either way most should find the LaCrosse more than adequate when it comes to roominess and comfort. 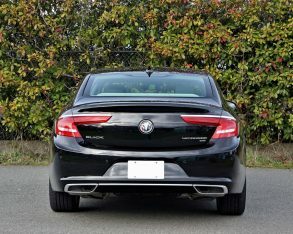 it was more than able for managing all the fast-paced curves I threw at it, its fully independent suspension wonderfully sorted and easily up to matching many of its premium-badged peers. 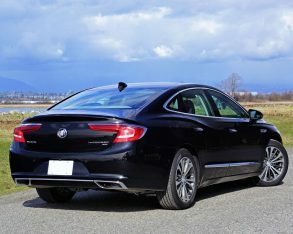 During some short testing stints I pushed it harder than I would normally with another car, because it’s a Buick and I needed to find out how far the new LaCrosse had been driven beyond its floaty, floppy past. 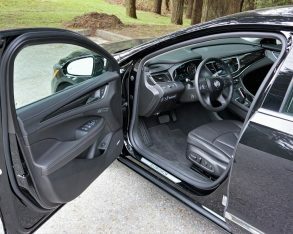 It held up very well, with a nice predictable balance between comfort and sport, while it’s certainly more capable than the cars it comes up against most often, such as the ES 350, Avalon, and possibly even the new Maxima. 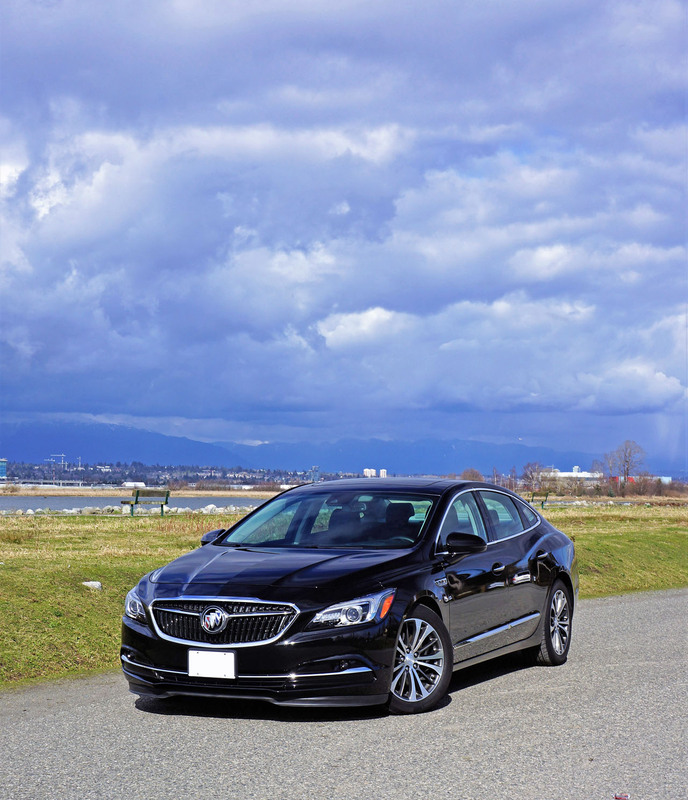 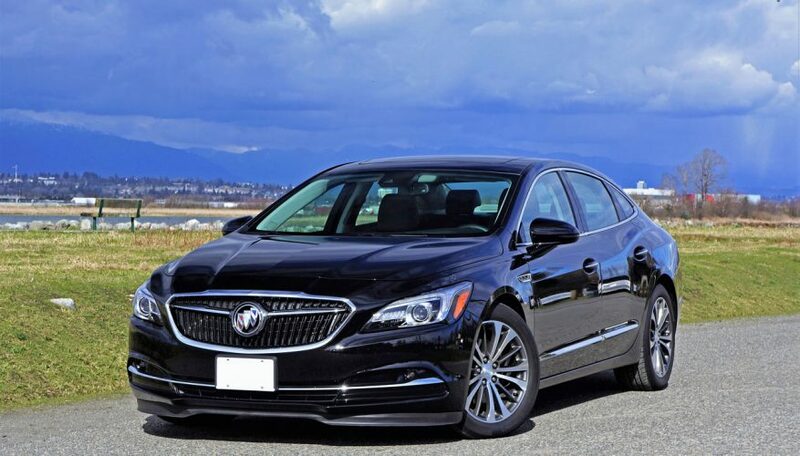 Where the Maxima can be harsh and unforgiving, particularly in its sportiest SR trim, the LaCrosse manages similar athletic feats while simultaneously pampering its driver and passengers with a smooth, comfortable ride, not to mention wonderfully hushed quietness throughout, a Buick trait. 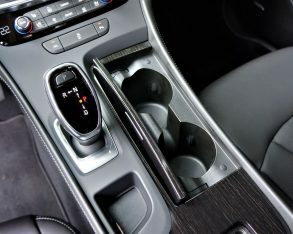 LaCrosse powertrain is much more enjoyable too. 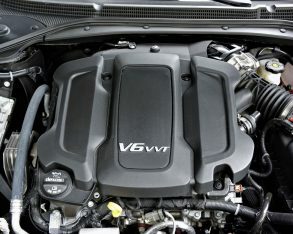 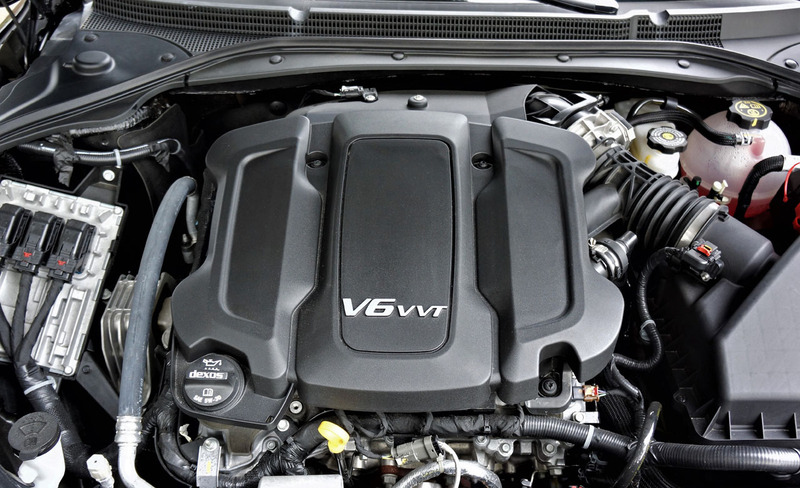 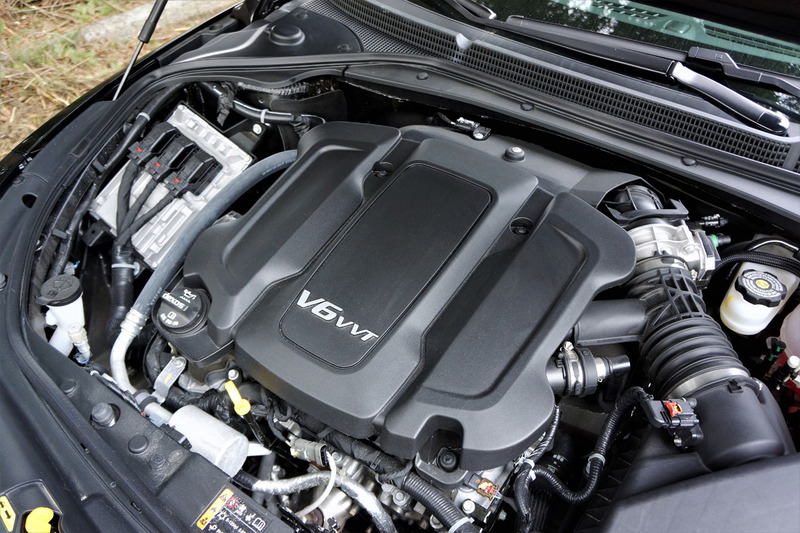 It’s potent V6 is extremely smooth, yet it’s good and punchy when called upon, even delivering a decent exhaust note, while the eight-speed automatic adds immeasurably more driver engagement than the Maxima’s CVT, even measuring up to those Germans noted earlier. 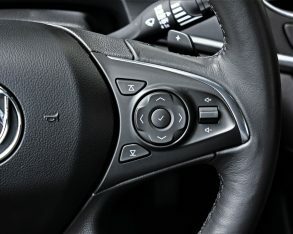 In fact it swaps cogs ideally, even being fun to row through the gears via those aforementioned paddle shifters. 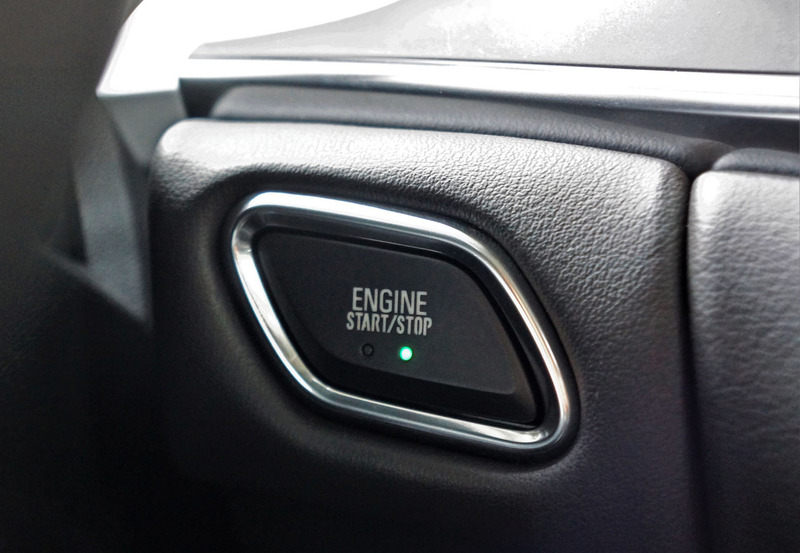 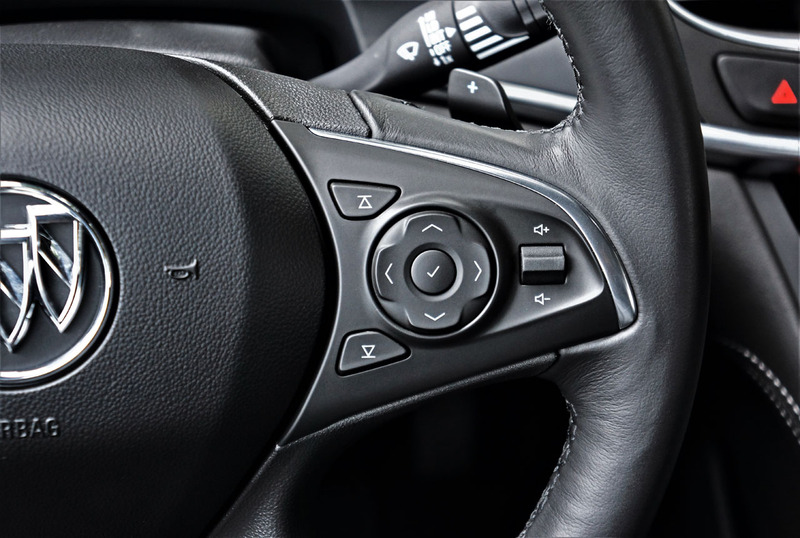 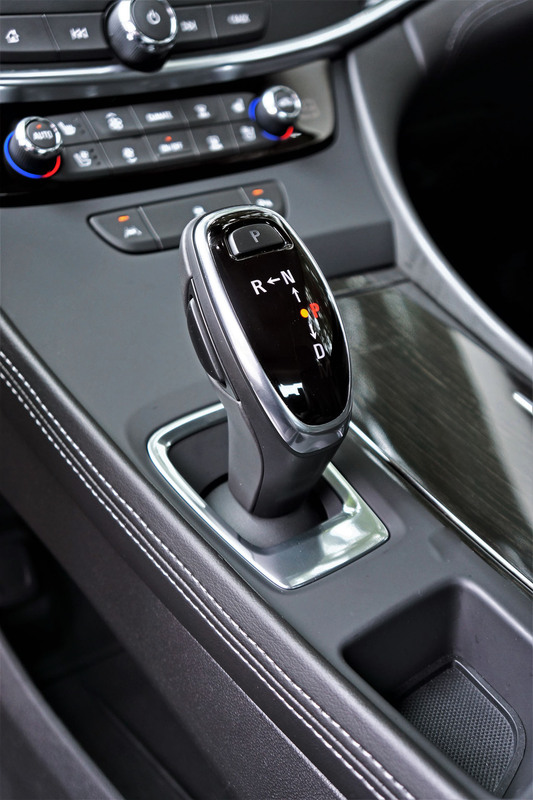 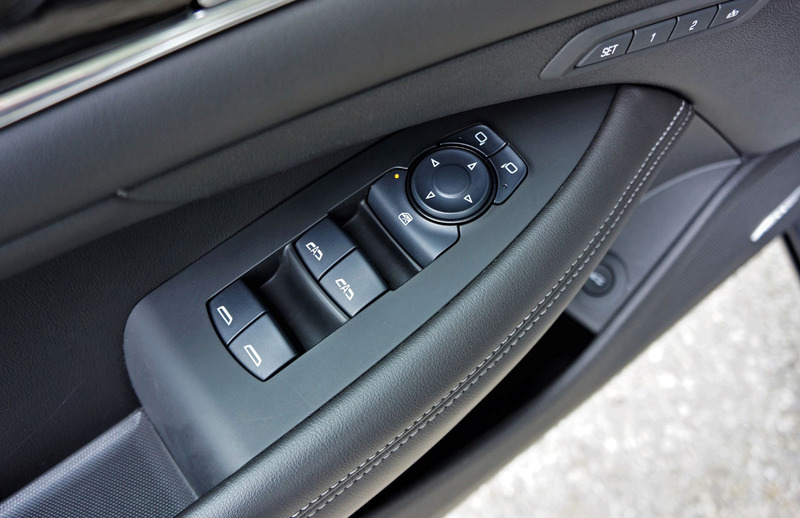 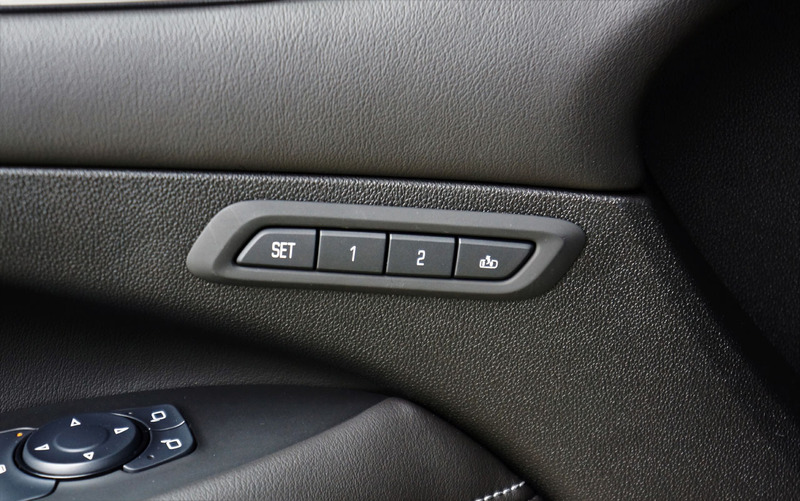 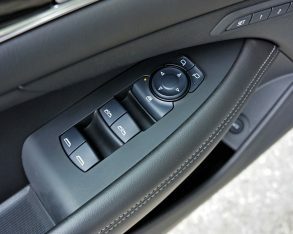 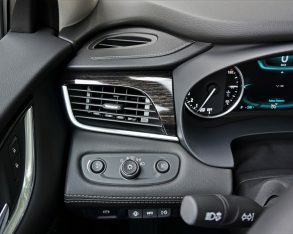 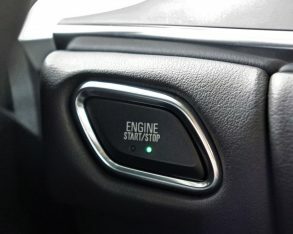 This said its console-mounted electronic shift lever takes some experience to become second nature, especially the pushbutton park selector on top, but everything else is as simple and straightforward as can be. 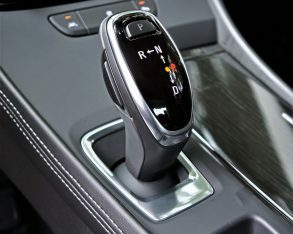 It all works smoothly, efficiently, and most important effortlessly. 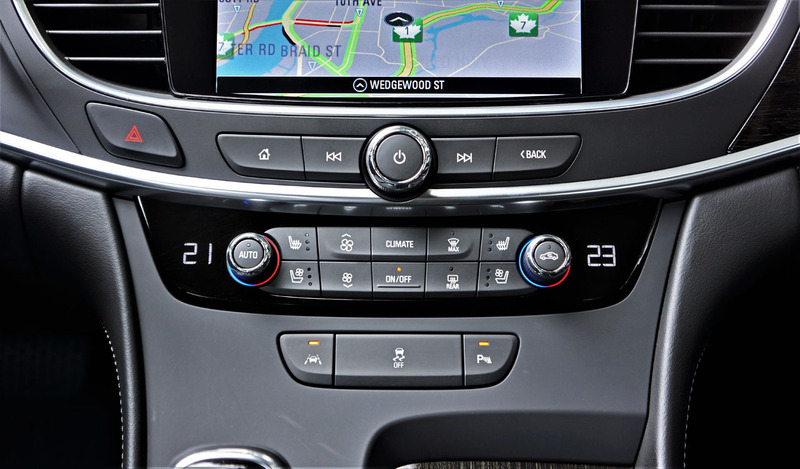 Truly, I could happily live with the new 2017 LaCrosse, especially as suited up in Premium AWD trim. 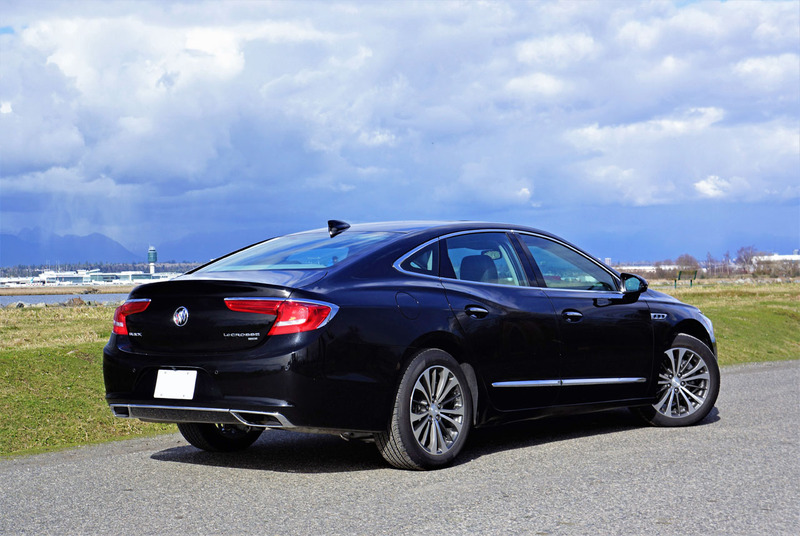 It’s a wonderful luxury sedan with impressive performance, plus many more features than most of its peers. 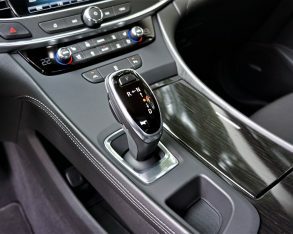 More importantly it’s a good well-rounded package that combines high quality with excellent functionality at a great price point, if only it’s timing wasn’t so poor. 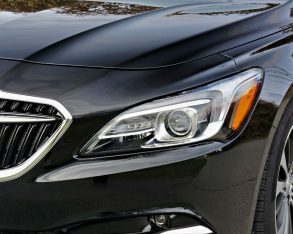 It’s simple bad luck that Buick shows up with its best-ever luxury sedan when the market wants its best-ever flagship crossover SUV, and while the new Envision delivers high on that scale within the compact SUV class, and the brand’s next-generation Enclave will no doubt satisfy its leagues of fans now waiting patiently for a much-due update, the large four-door sedan market segment is on a bit of a downer. 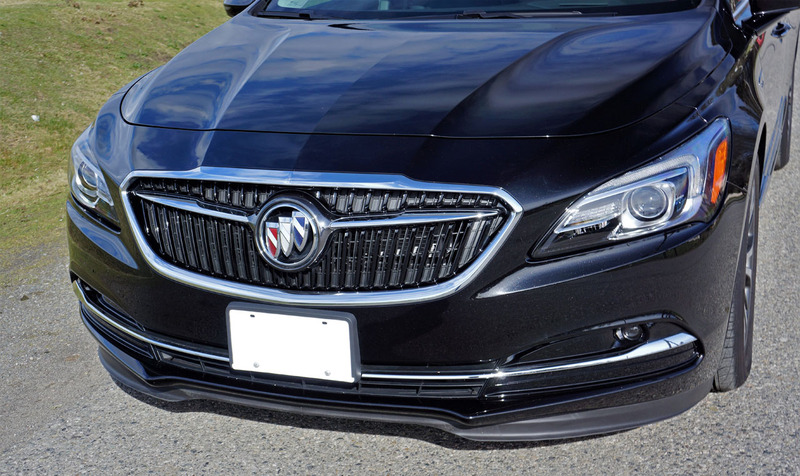 Then again, if Buick managed to incorporate more of the Avenir Concept’s design cues into this already handsome model, luxury buyers might not be able to resist. 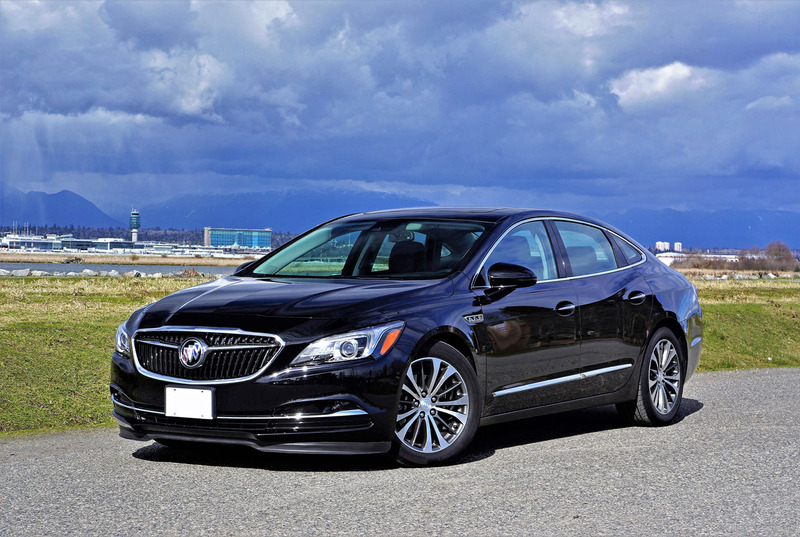 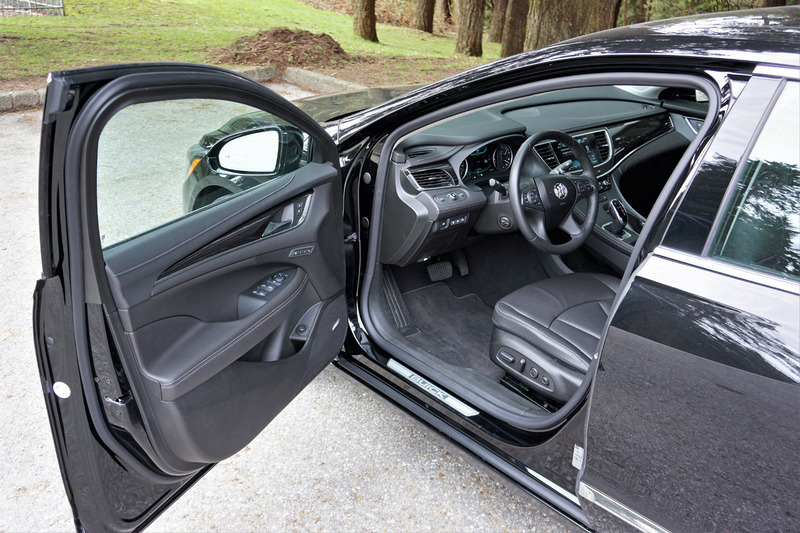 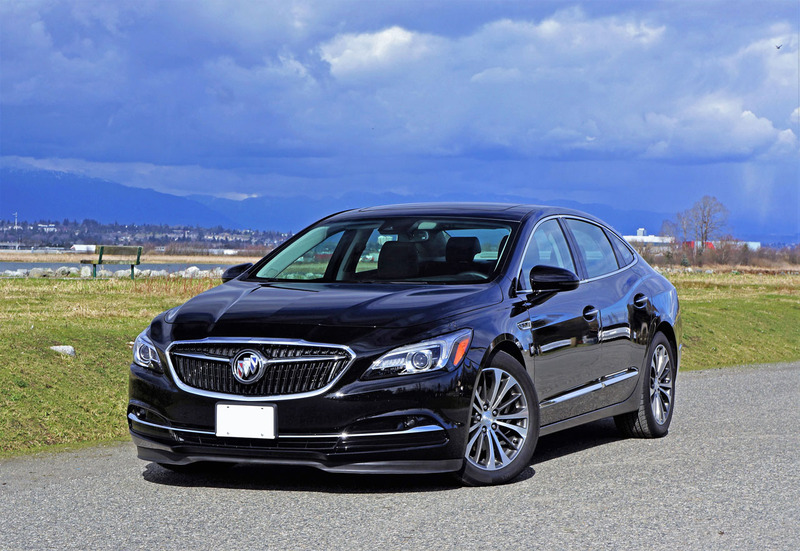 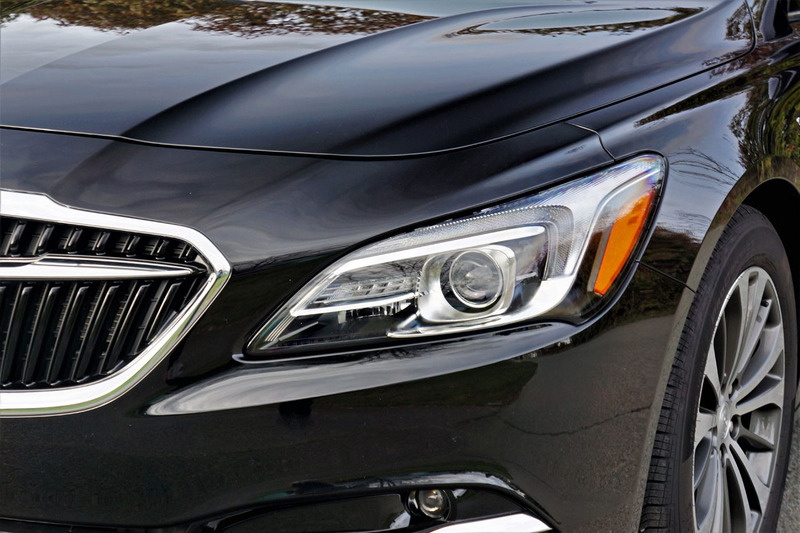 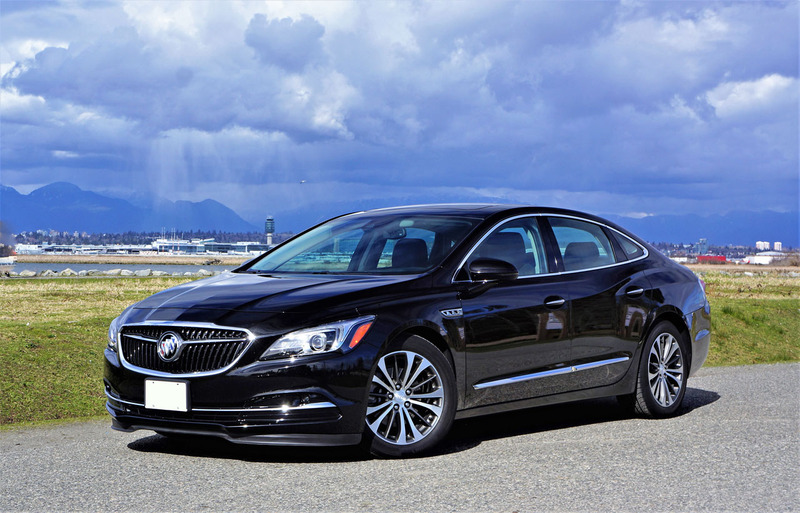 Either way Buick has come a long way with its LaCrosse, a car that should be seriously considered by those snubbing the SUV status quo and opting for a large luxury sedan.